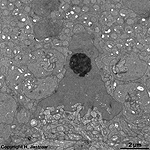 The retina of the eye (Terminologia histologica: Retina) consists of a sensory part for vision (Pars optica) and a small marginal blind zone (Pars caeca, which has a part that covers the iris; Pars iridica and a further part covering the ciliar process; Pars ciliaris). 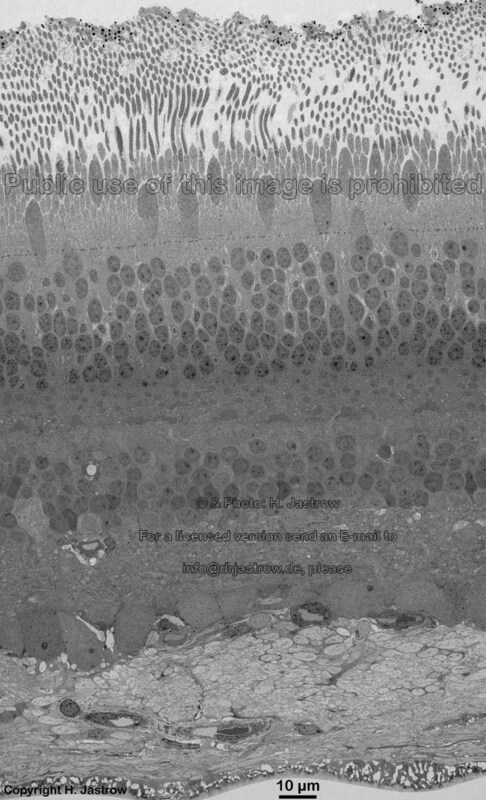 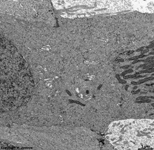 The small blind zone has a monolayered prismatic epithelium. 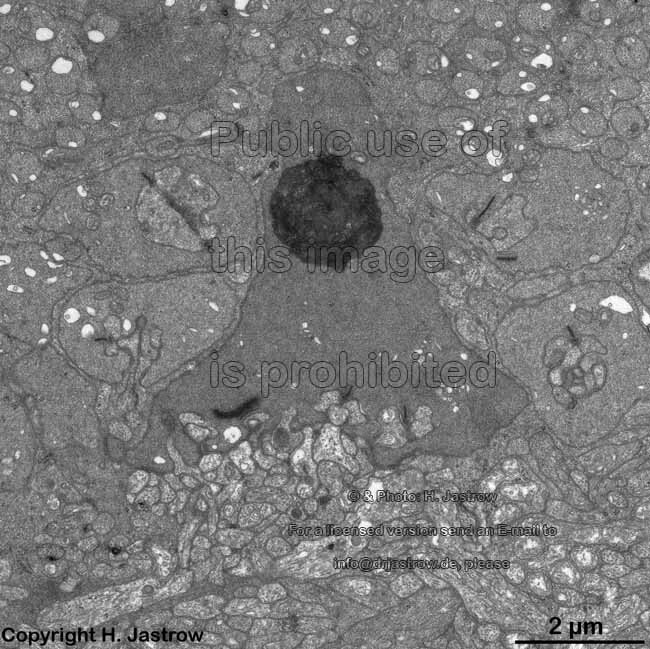 In contrast to that the Pars optica has a very complex structure and two areas that differ from the general composition descibed below: the papilla of the optic nerve (Discus / Papilla nervi optici = blind spot; diameter ~ 1.7 mm) and the yellow spot (Macula lutea). 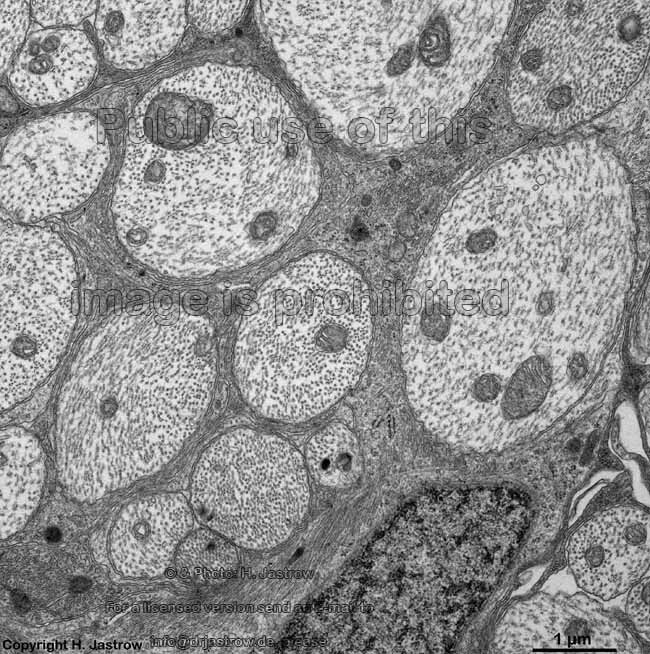 The optic neve leaves the eye in the region of the Papilla nervi optici, further the retinal vessels (Arteria and Vena centralis retinae) enter the ocular bulb here. Due to this no sensory cells but only non-myelinated nerve fibres and vessels are present in this region (see clinical image). 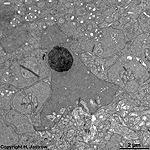 Lateral (temporal) thereof the Macula lutea, which is ~3 mm in diameter, is located in the centre of the retina. 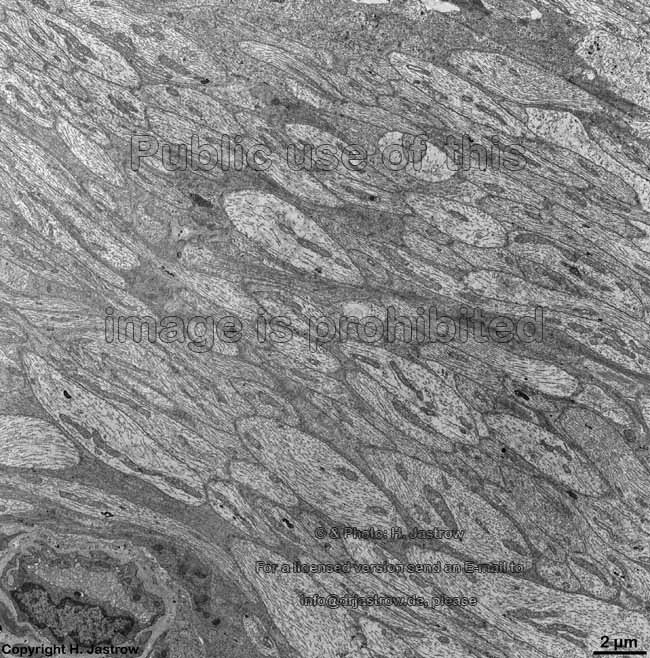 It has a central funnel-like depression, the central fovea (Fovea centralis; diameter ~ 1.5 mm), which is the spot with maximal visual acuty, i.e. 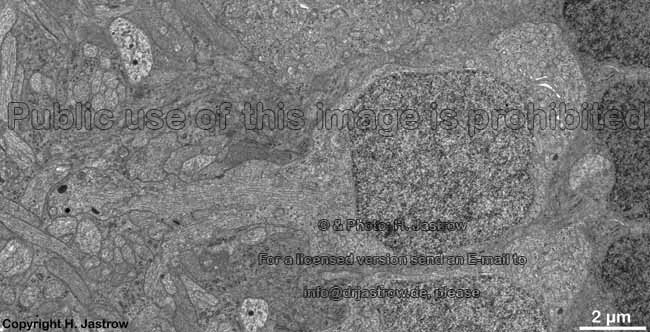 the highest spatial resolution. 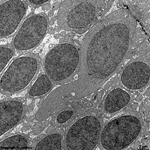 The Foveola is located in the centre of the fovea. 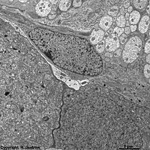 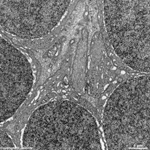 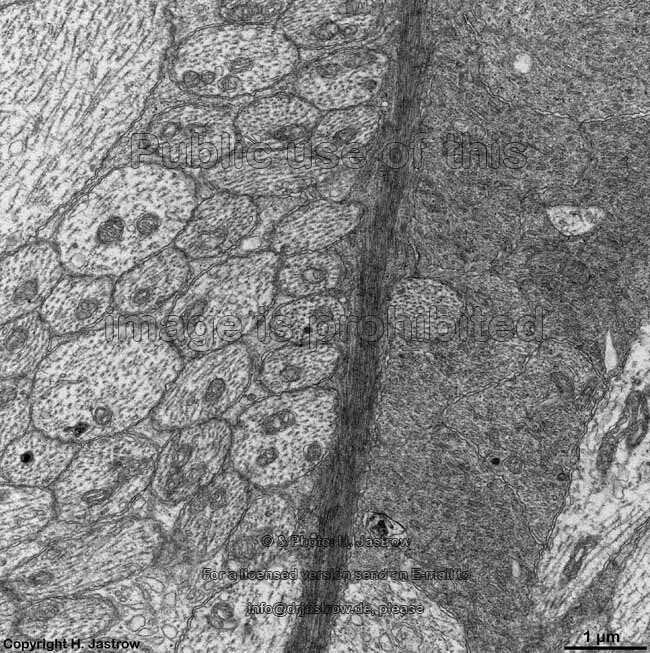 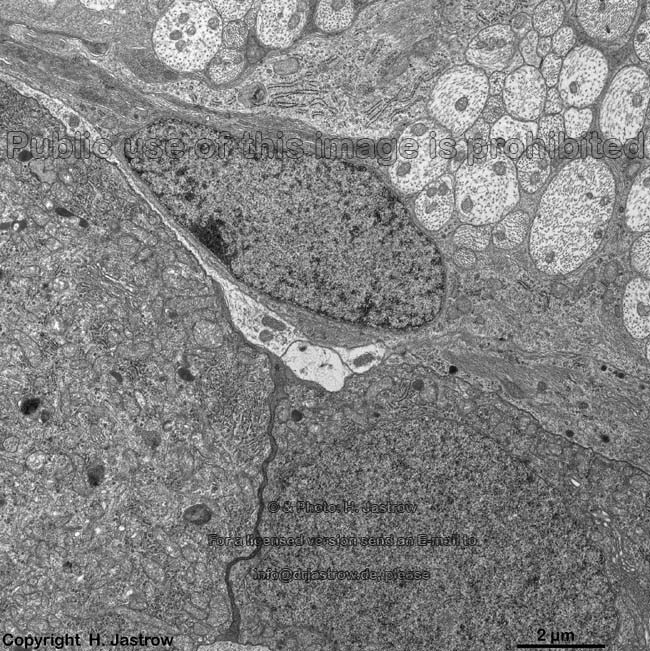 It is the thinnest area of the pars optica, has a diameter of 0.35 mm and only consists of cones and processes of Müller glial cells. 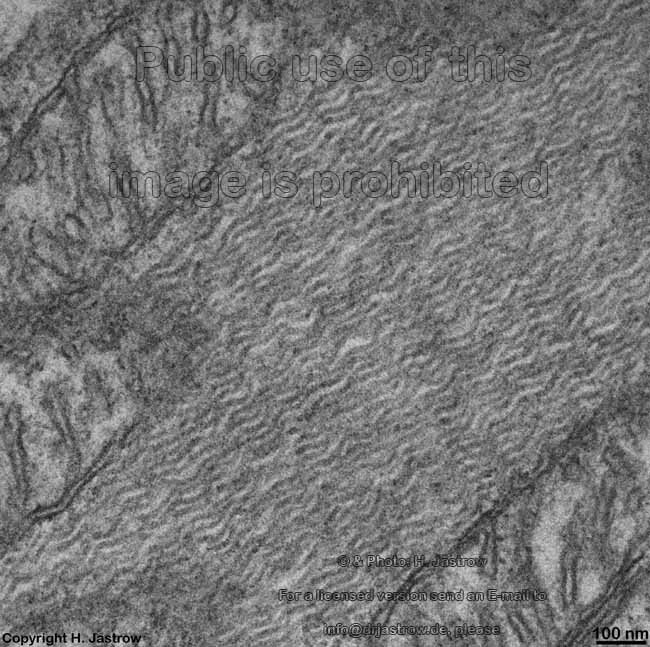 Incoming light is not dispersed by covering layers in this area. 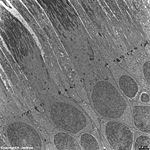 The foveal cones have a 1:1 connection to ganglion cells this allows highest spatial. 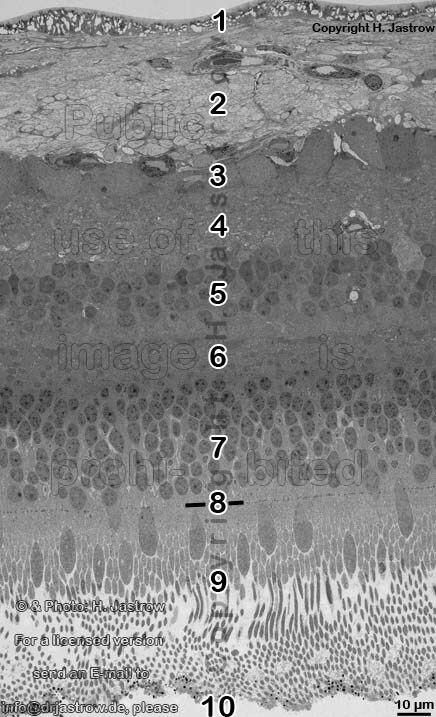 The number of rods which first appear in the foveal area increases towards the periphery; in surrounding macula rod and cone number is about equal then rods rapidly increase while cones decrease. 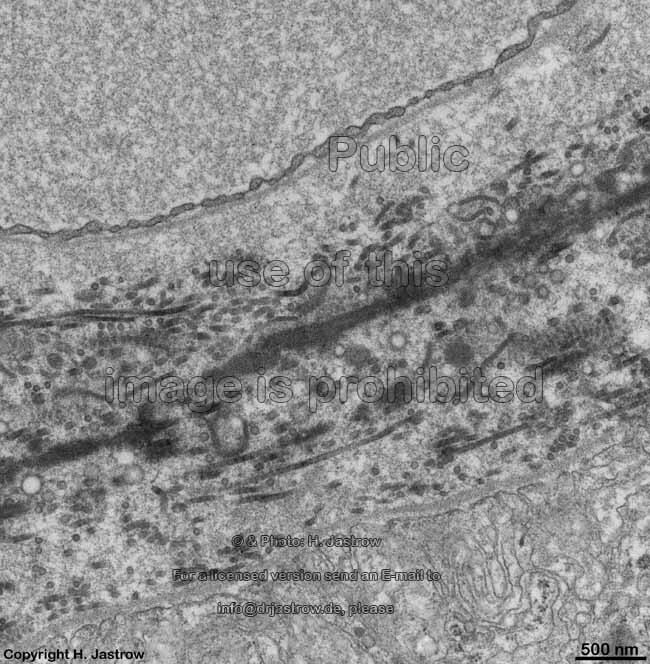 1. inner limiting membrane = Stratum limitans internum (--> images) borders the vitread body (Corpus vitreum) with a basal lamina which has considerable regional differences in thickness, radial fibres spread above the basal lamina which are the endings ofMüller Glial cells. They are connected to each other via small tight junctions just above the basal lamina. 4. inner plexiform layer = Stratum plexiforme internum (--> images) contains the synapses between the second (bipolar cells) and the third neurons (ganglion cells) of the visual pathway. 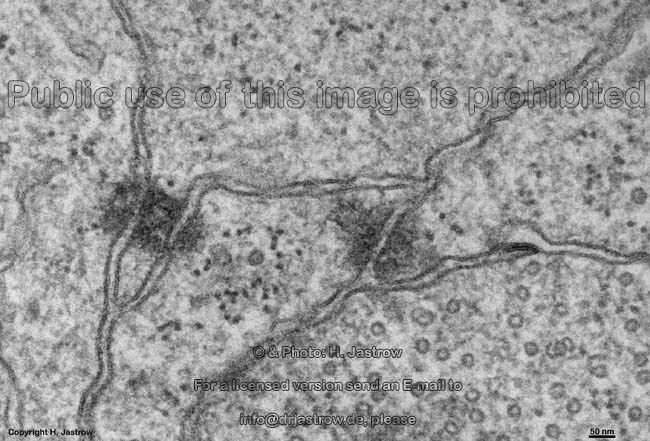 Most of these synapses are ribbon synapses with synaptic bodies, further many conventional chemical and a few electrical synapses are present here. 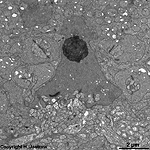 5. inner nuclear layer = Stratum nucleare internum (--> images) with perikarya of A. bipolar cells (rod- and cone bipolar cells = second neurons of the visual pathway which can be further callsified in many fuctionally different types), B. some amacrine cells, which are located at the border to 4, C. horizontal cells, which are also less frequent and located at the border to 6. 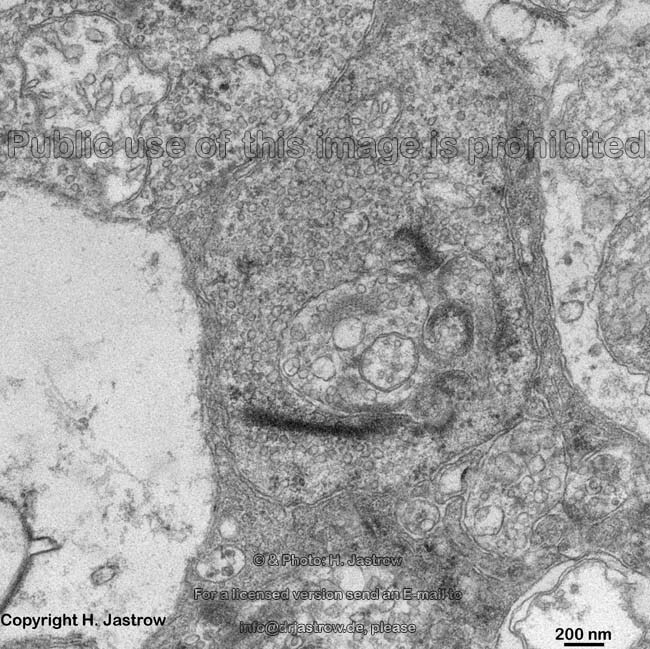 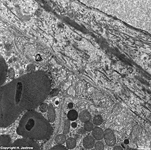 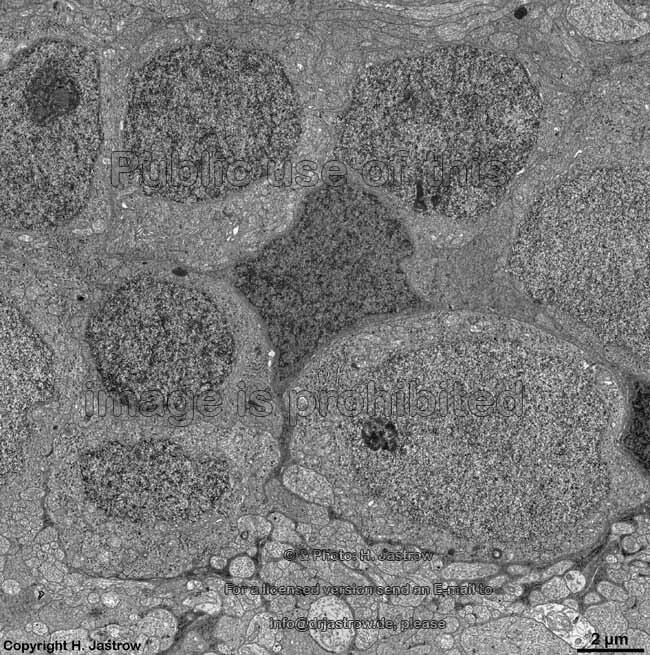 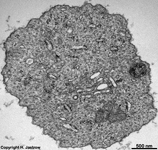 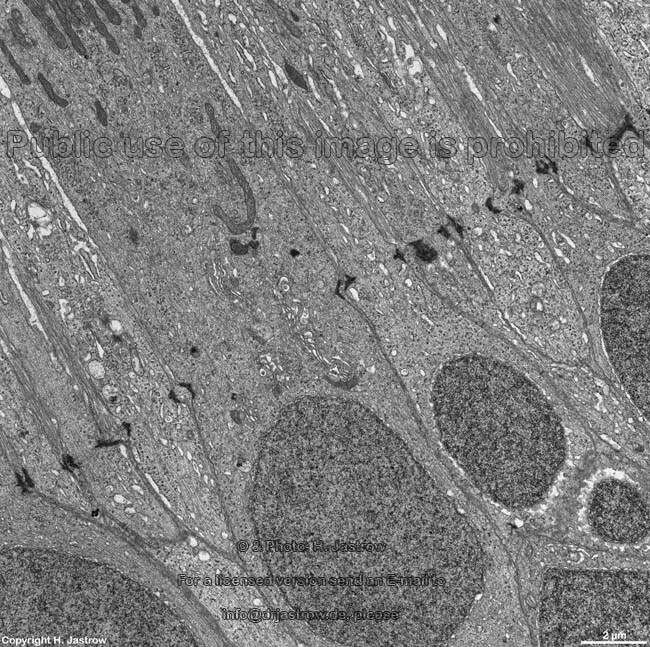 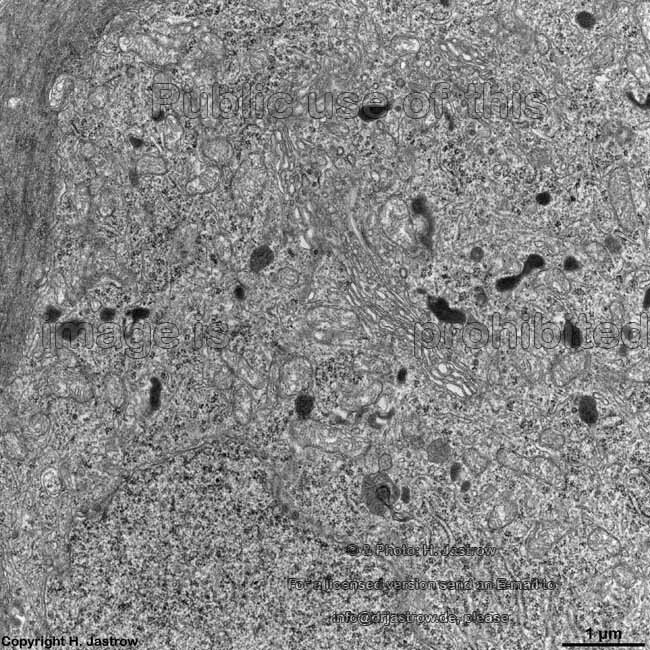 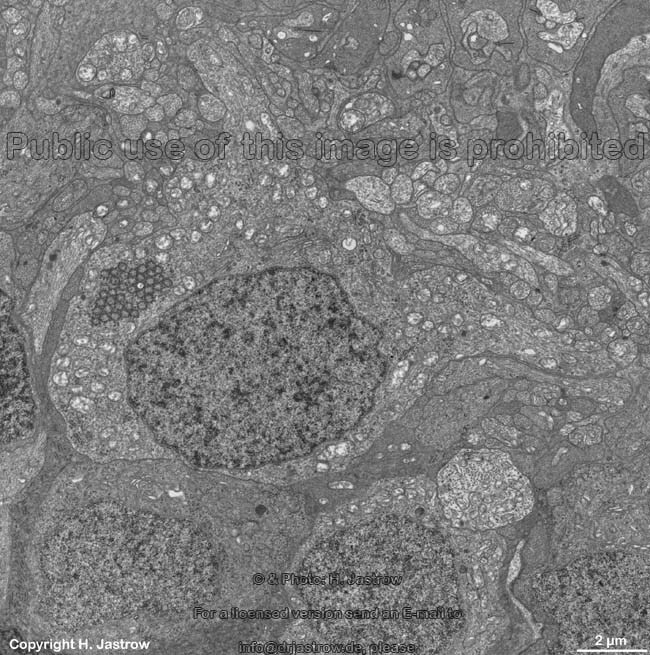 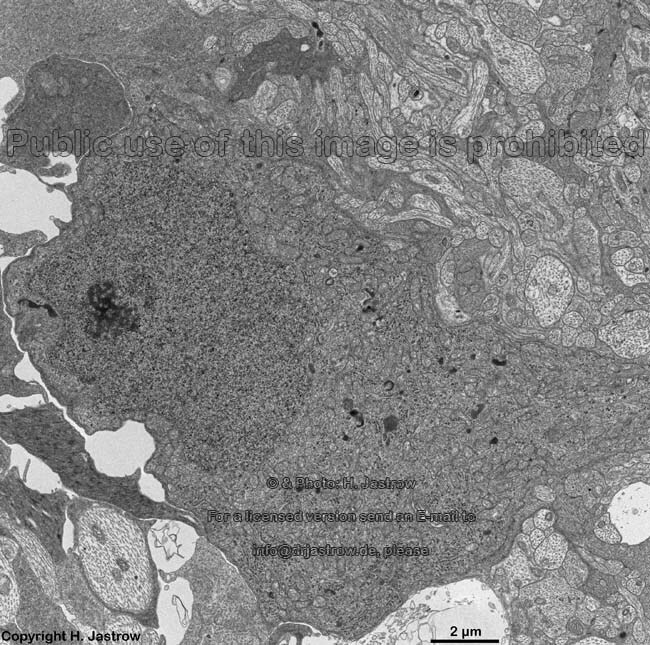 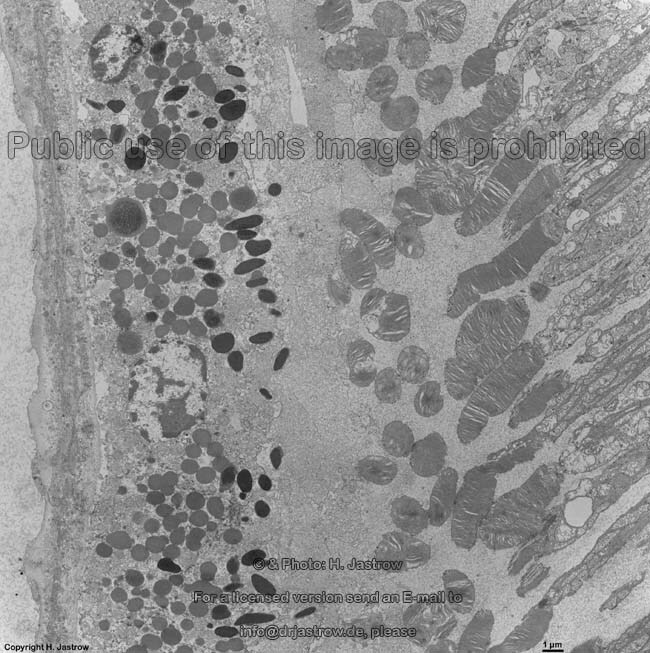 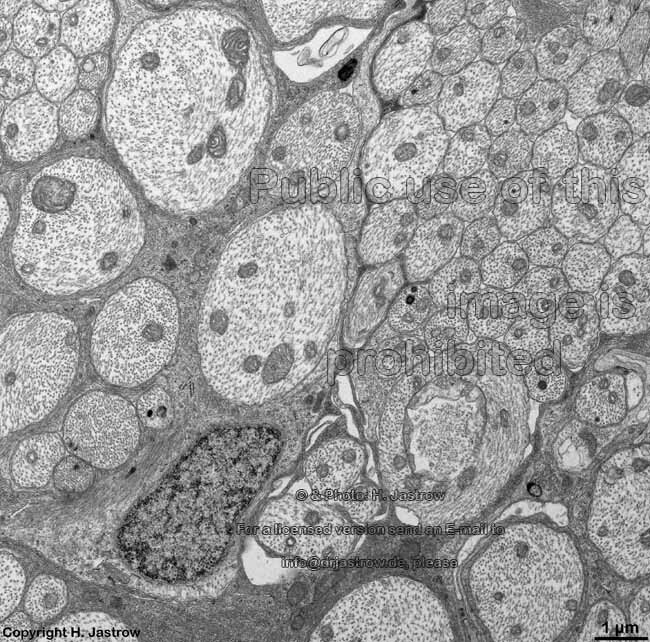 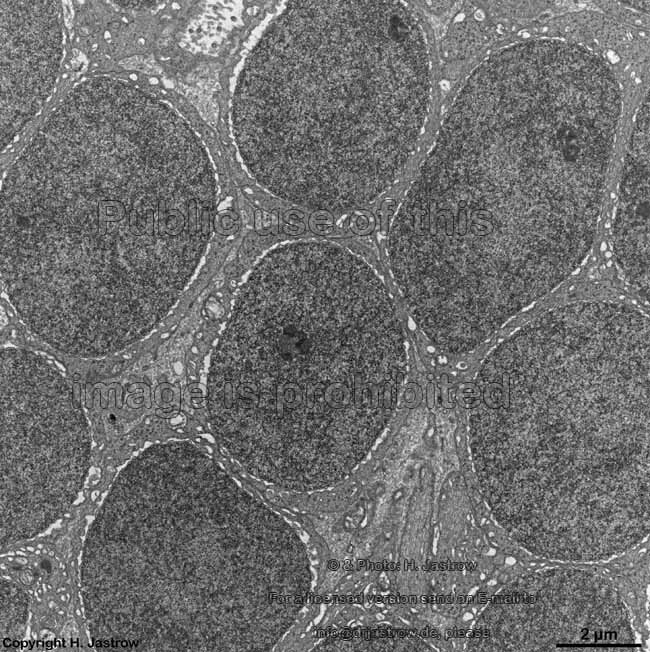 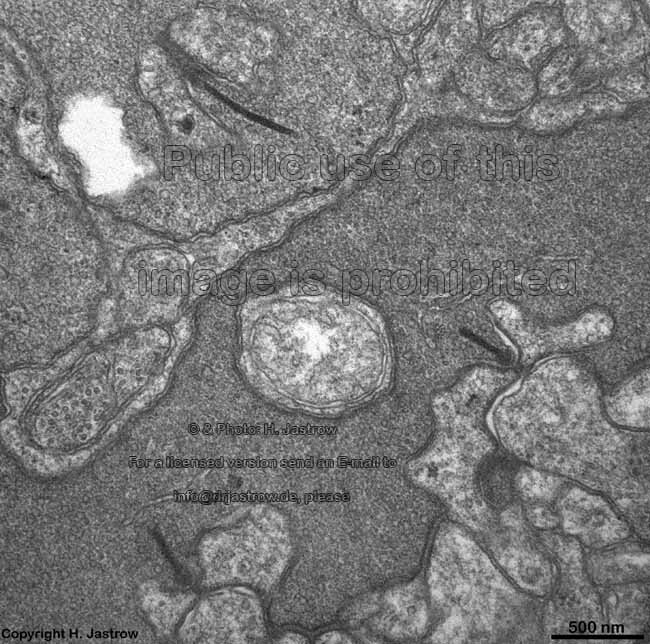 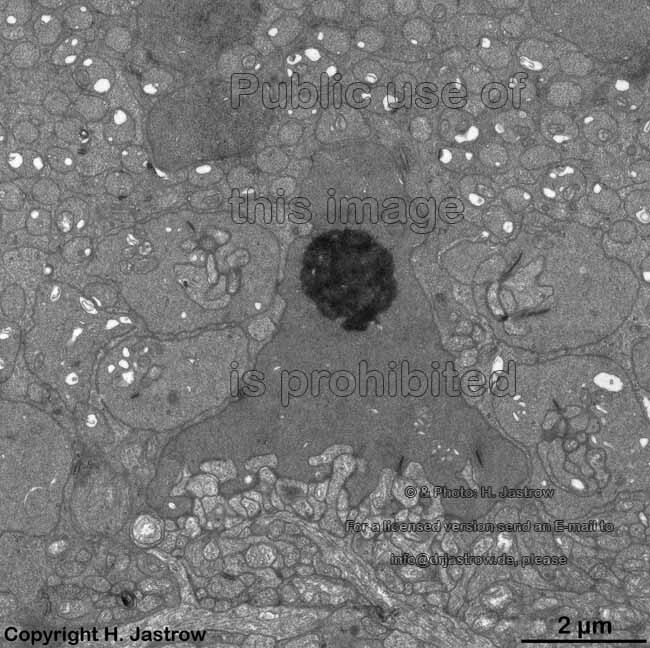 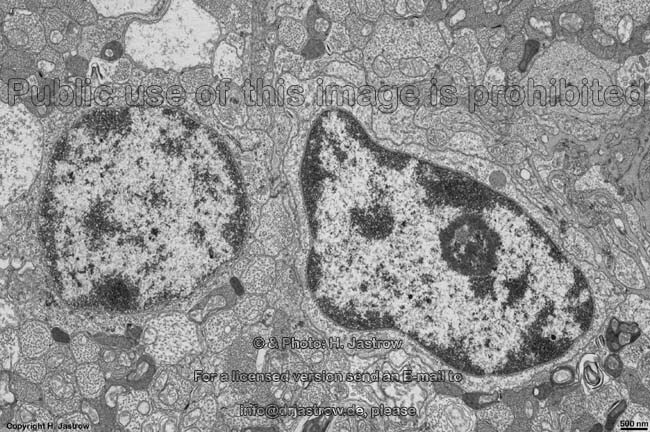 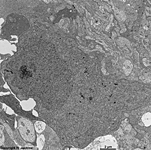 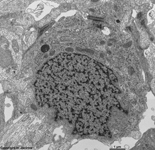 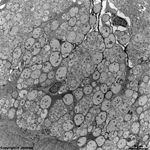 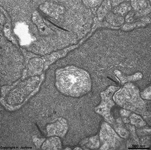 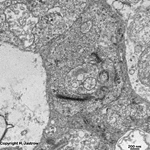 Some of the horizontal cells show very large aggregated macrotubules in their cytoplasm. 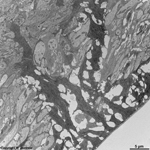 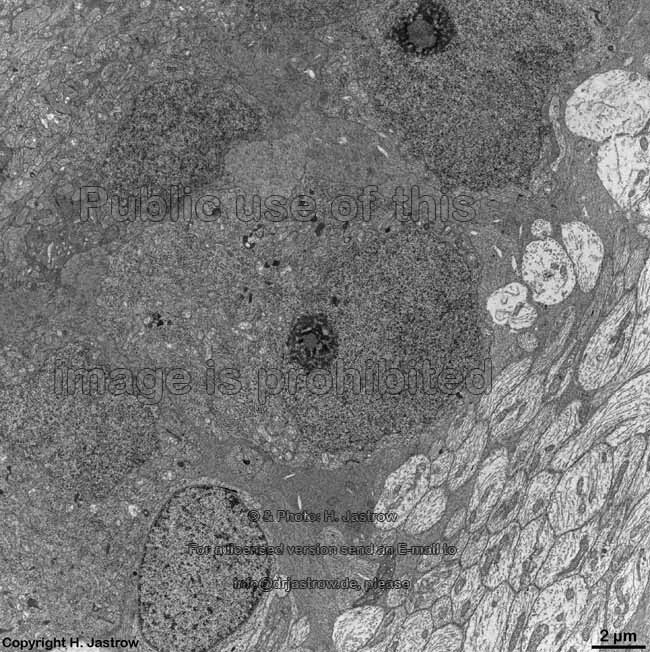 D. some intermingeled nuclei of radial fibre cells, i.e. 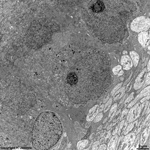 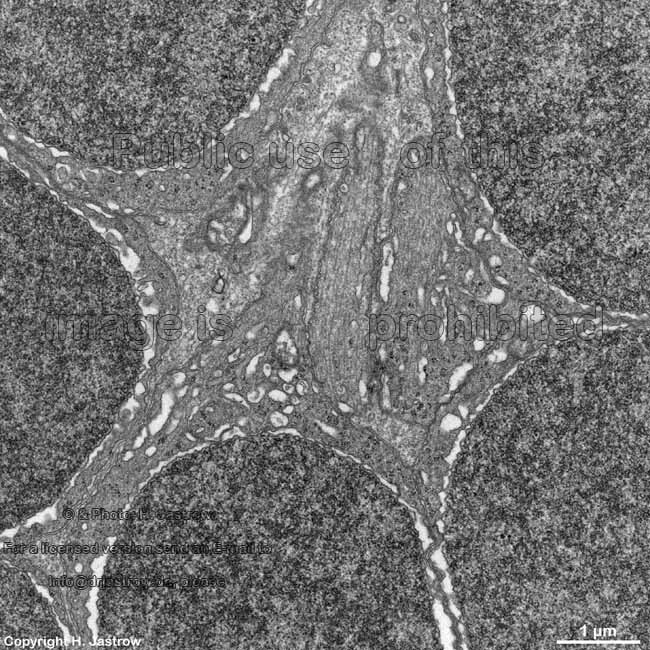 Müller's glial cells. 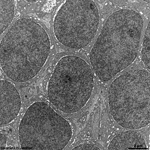 6. outer plexiform layer = Stratum plexiforme externum (--> images) Processes of horizontal and bipolar cells are invaginated into the terminals of the photoreceptor cells (rods and cones) that show special electron-dense cell organelles, the synaptic ribbons, close to their presynaptic membranes in this area. 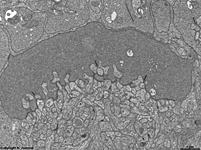 The resulting ribbon synapses serve for ultrafast (tonical) signal transduction to the dendrites of the second neurons of the visual pathway (rod- or cone bipolar cells). 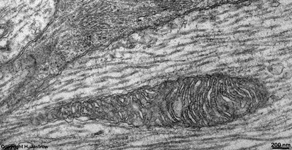 Two bizarrely formed horizontal cell processes with terminal swellings are present in one invagination of rod terminals that often is subdivided in two endings. 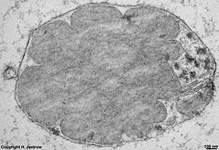 Whereas these horizontal cell terminals are located laterally, 1 - 3 thin bipolar cell processes comprise the centre of a ribbon synapse. 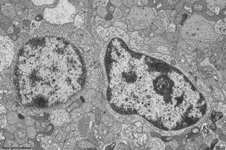 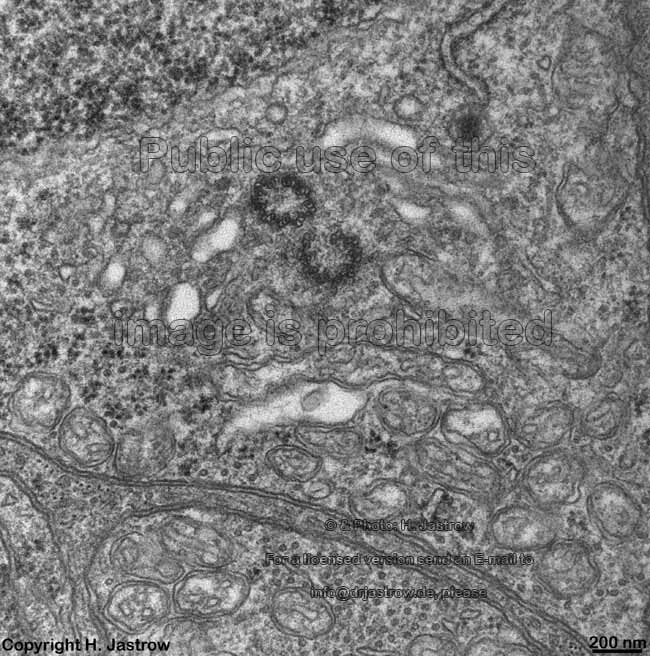 In contrast to that cone terminals always show 25 up to over 50 invaginations with usually two lateral horizontal cell processes around 1 - 2 short bipolar cell dendrites. 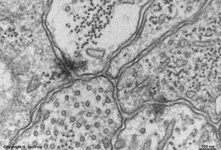 Apart from the majority of ribbon synapses, conventional chemical synapses are present outside the invaginations. 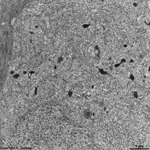 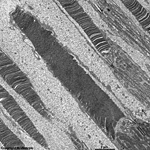 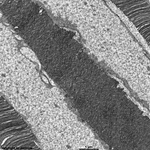 Electrical synapses (gap junctions) are rare in this layer. 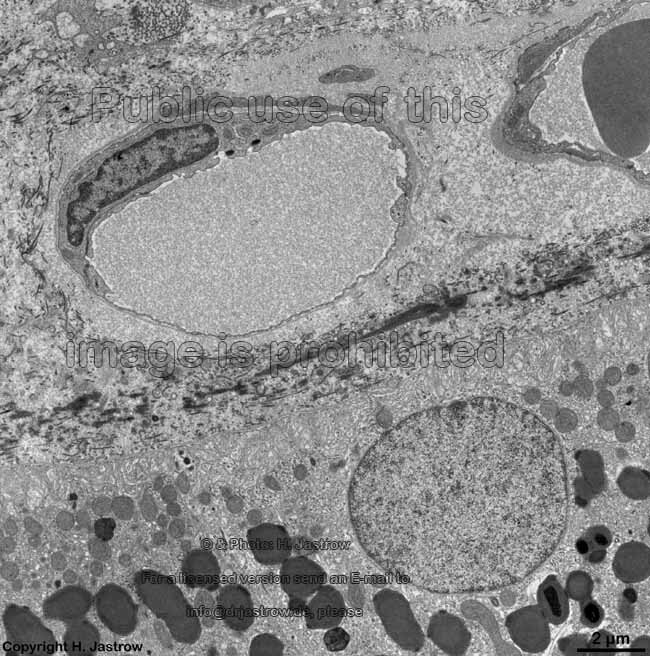 9. layer of inner and outer segments of rods and cones = Stratum segmentorum externorum et internorum (--> images) upper part: inner- and lower part: outer segments of rods and cones. 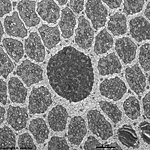 The Ellipsoid is the part of the inner segment of a photoreceptor that is closer to the outer segment. 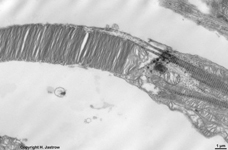 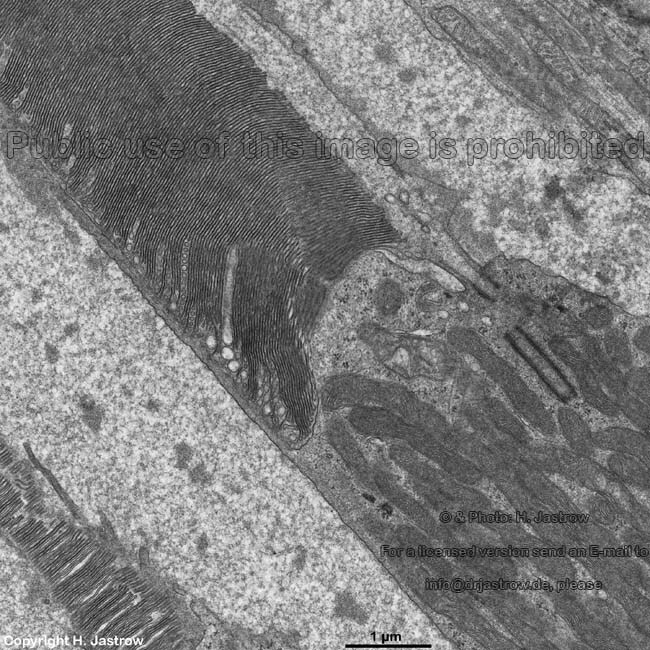 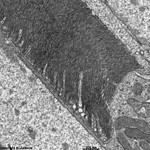 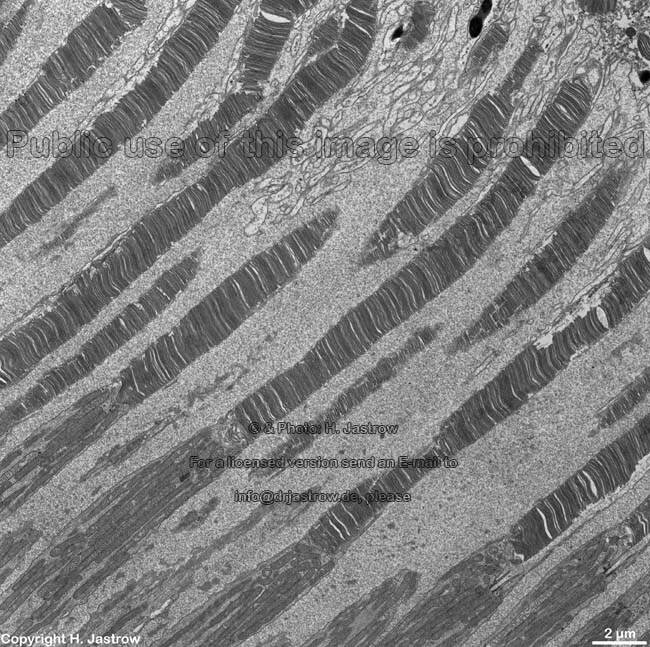 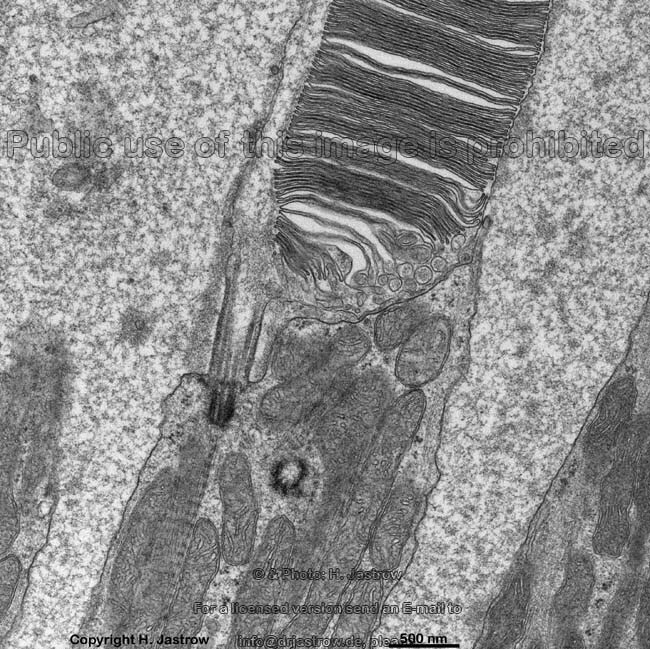 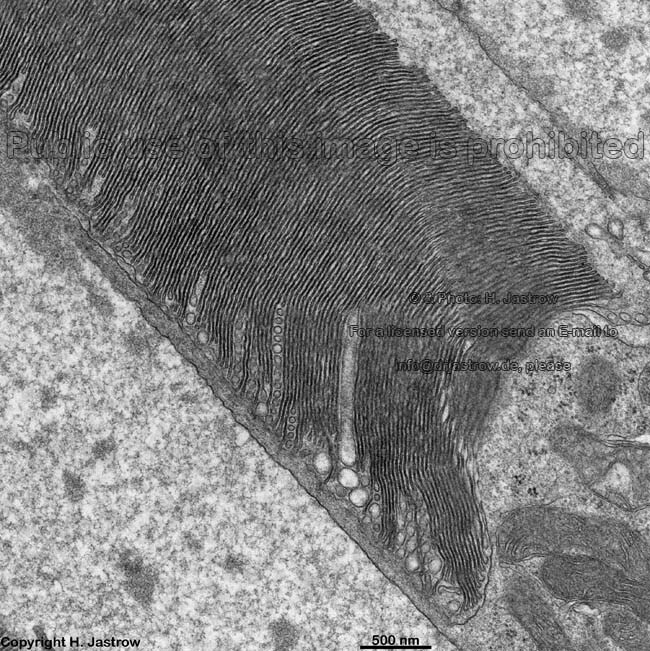 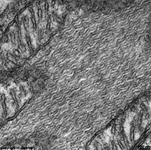 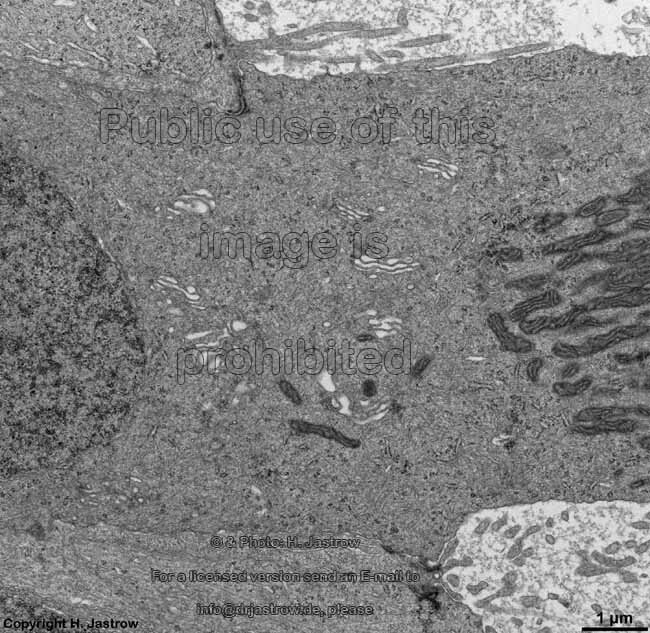 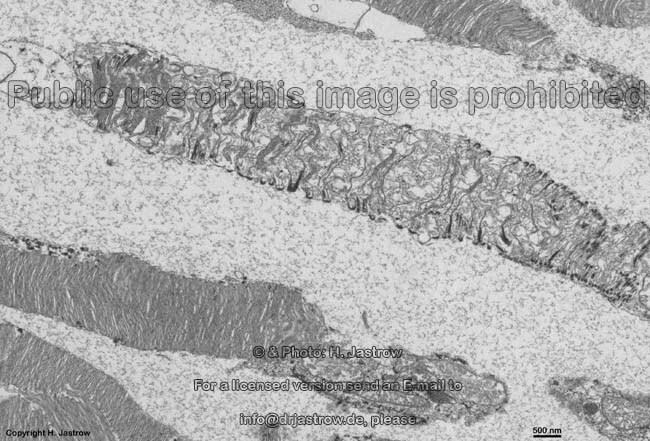 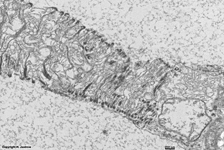 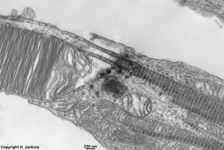 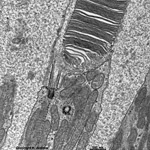 It is very rich in mitochondria, shows some root fibres, wave-like bundles of intermediate filaments and microtubules. 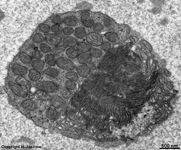 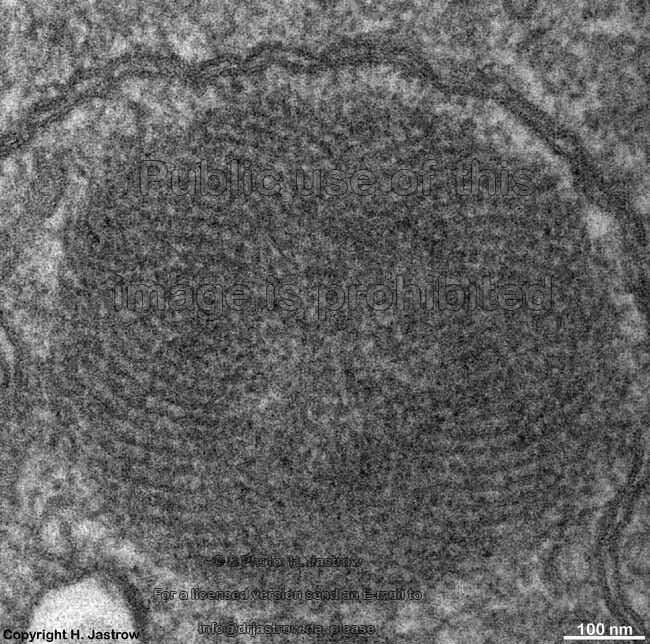 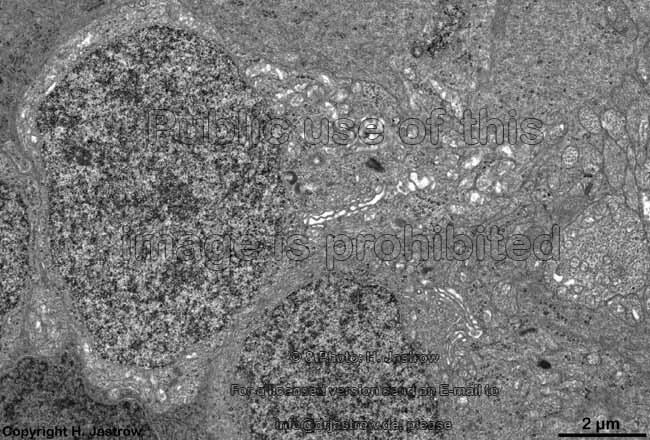 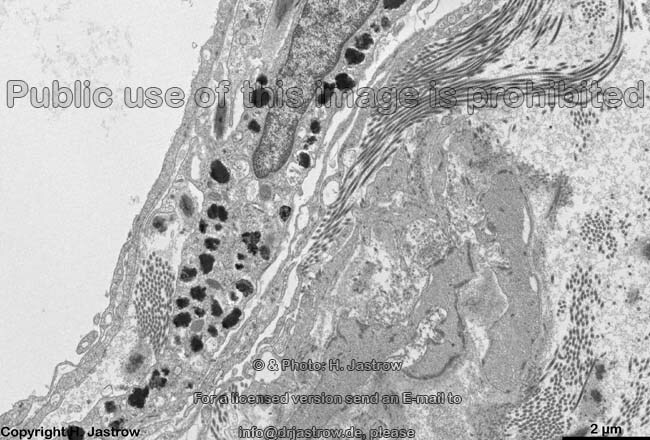 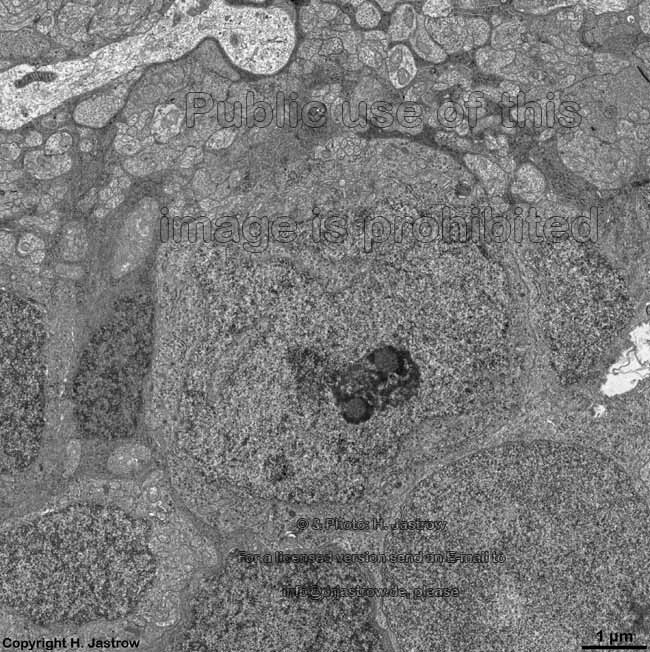 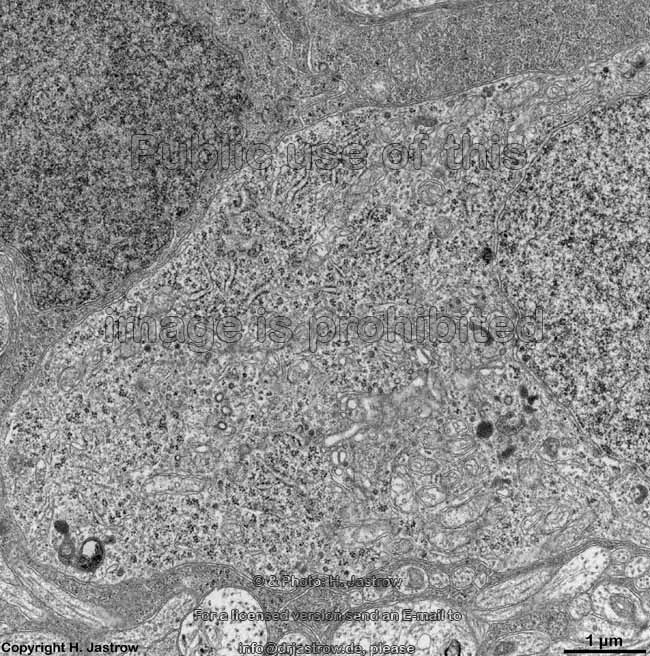 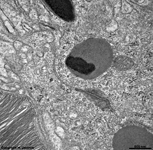 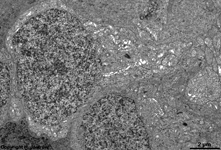 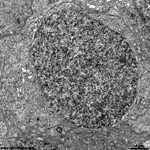 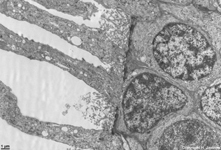 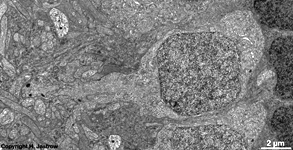 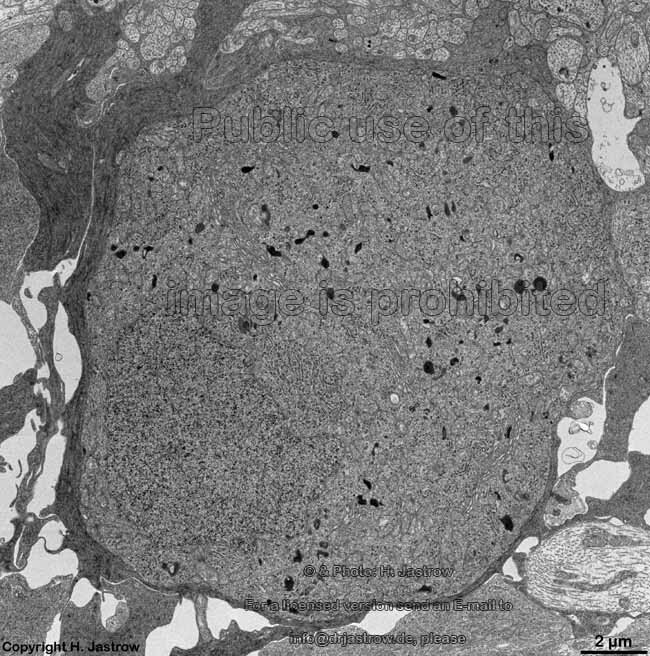 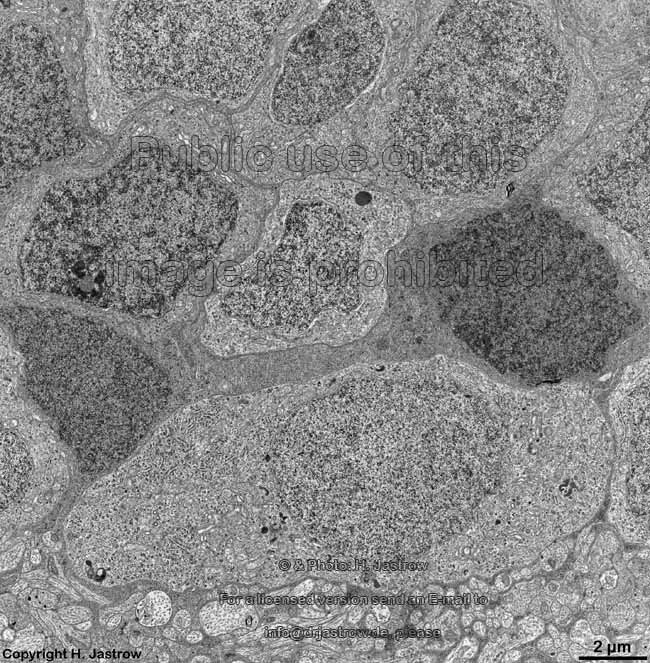 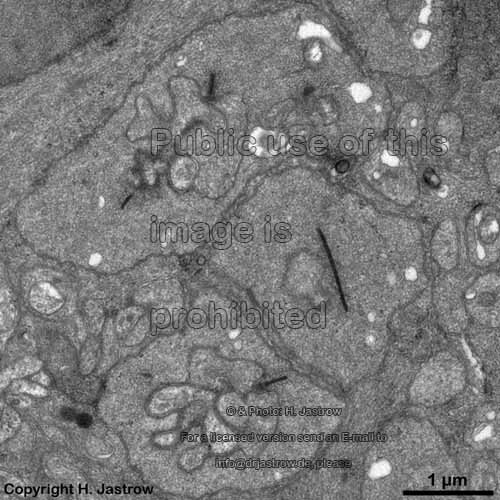 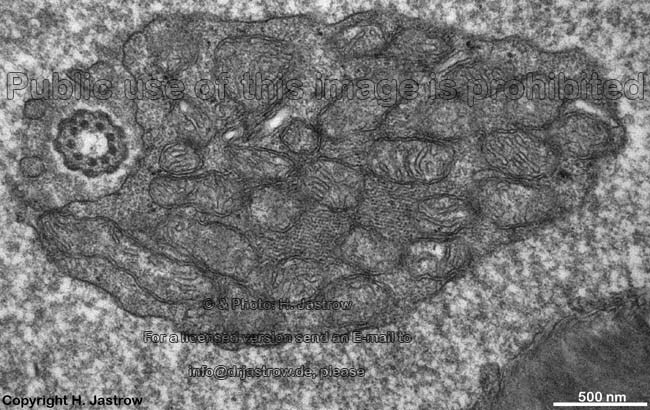 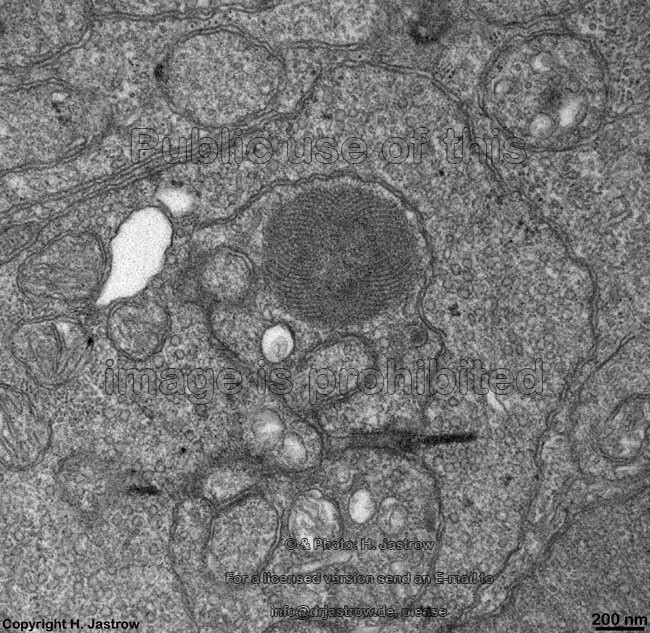 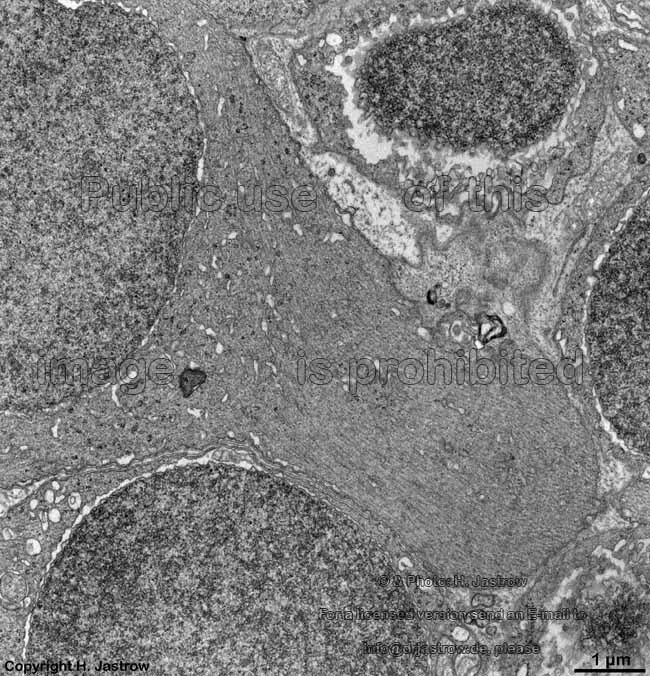 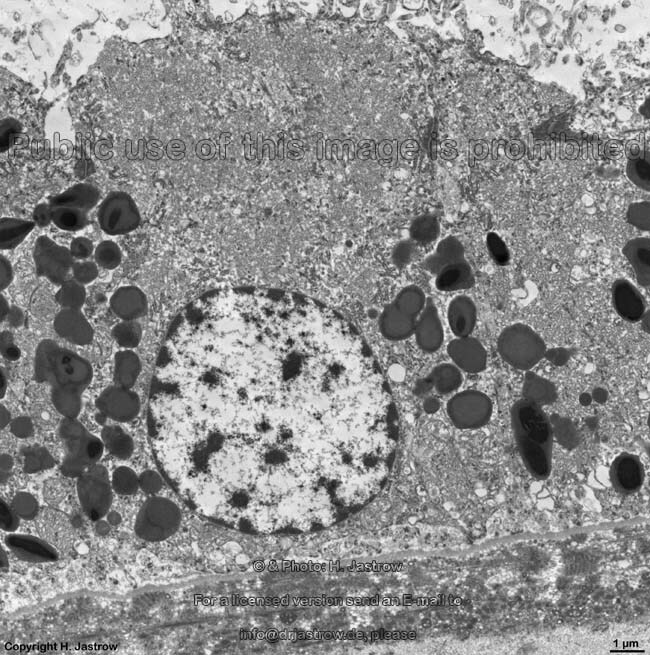 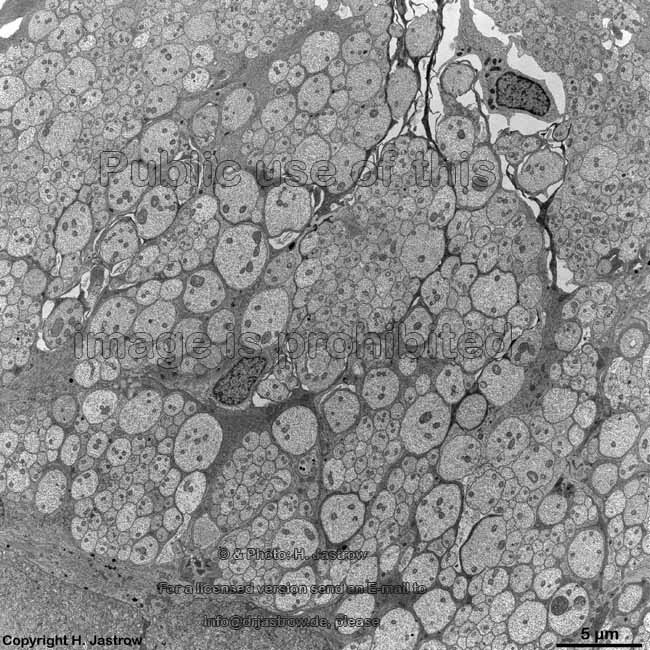 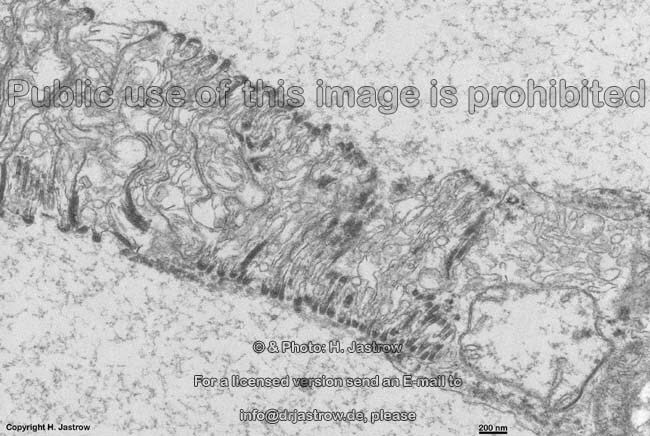 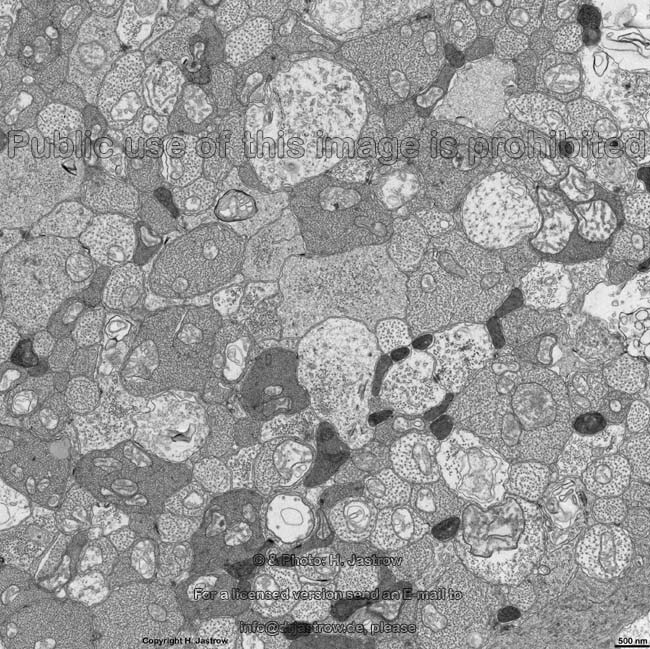 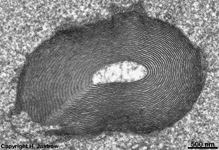 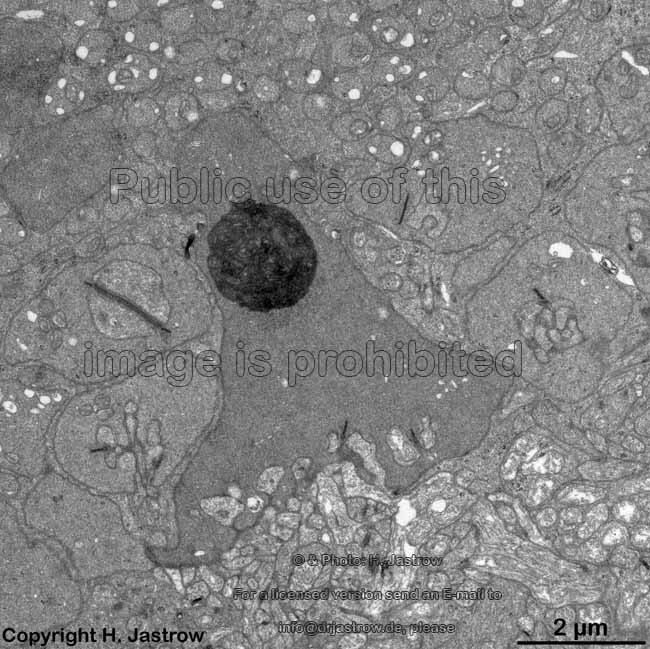 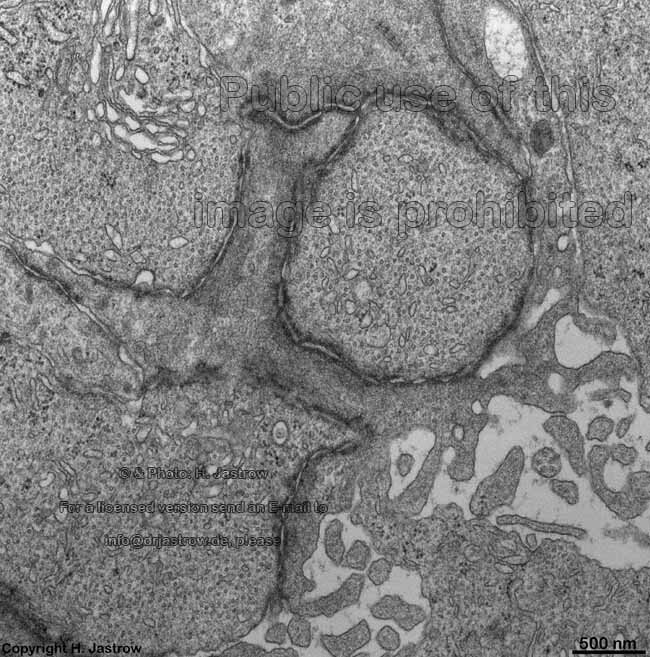 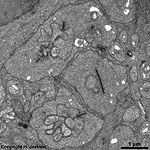 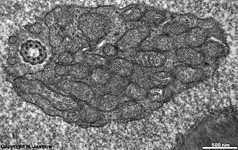 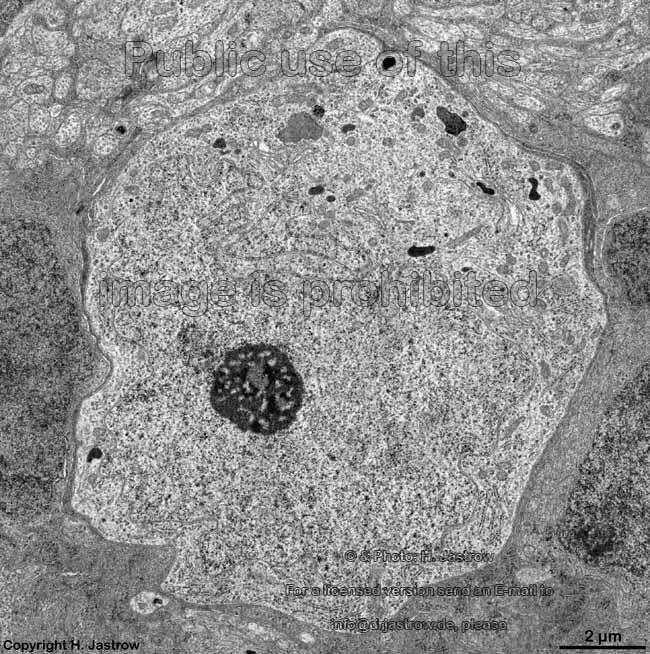 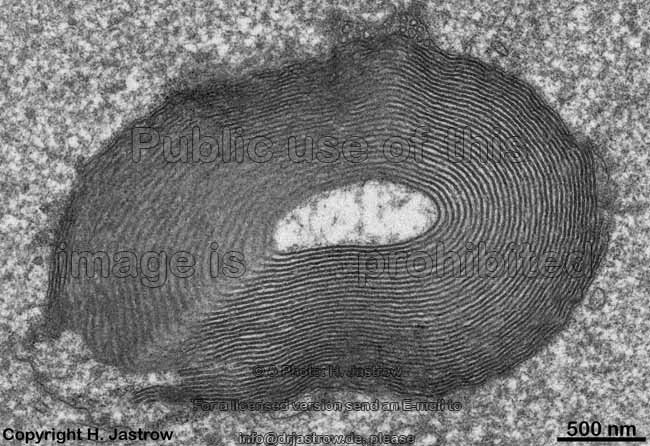 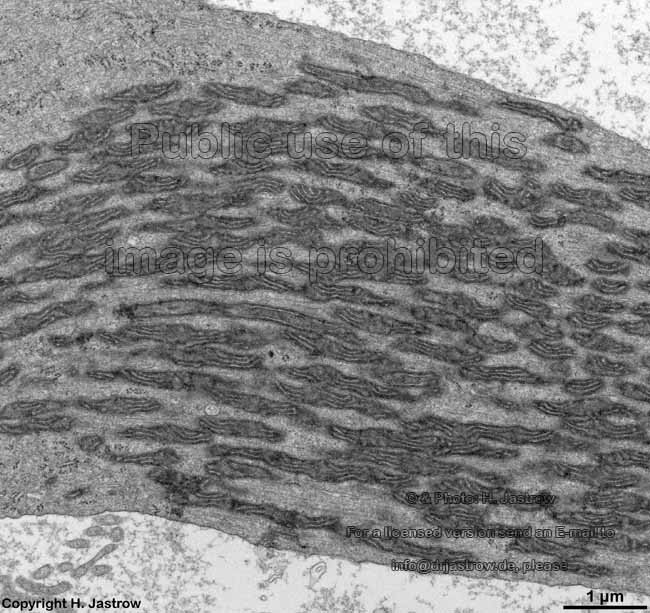 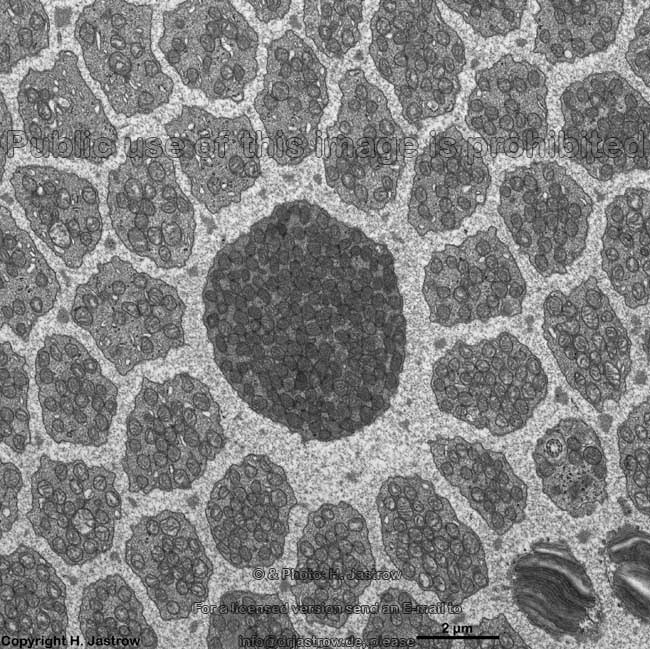 The ellipsoid continues into the Myoid, the lower part of an inner segment which is rich in Golgi-apparatuses and RER but hardly shows any mitochondria. 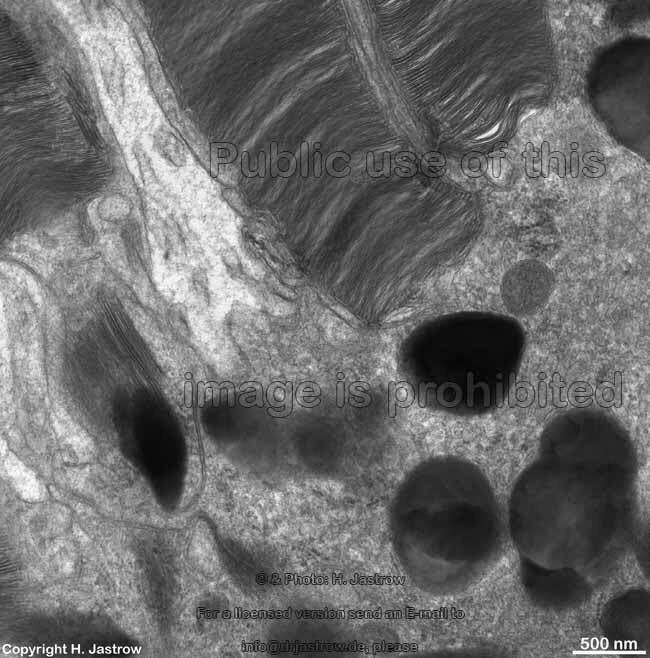 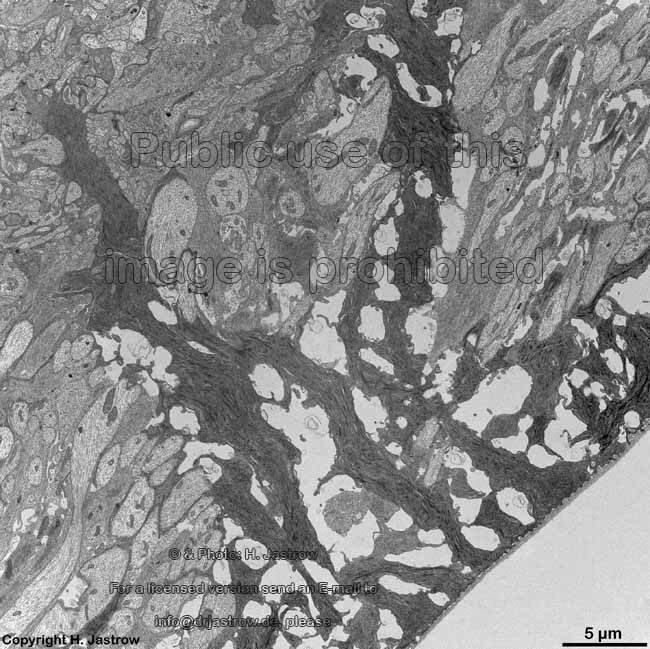 The inner and outer segments are surrounded by a liquor filled space into which long, thin processes of Müller's glial cells reach from outside whereas from inside other long, thin processes of pigment epithelial cells protrude. 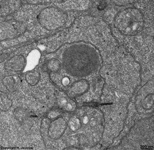 The outer and inner segments are connected to each other only via a narrow cytoplasmatic bridge containing a cilium with 9x2 + 0 microtubules. 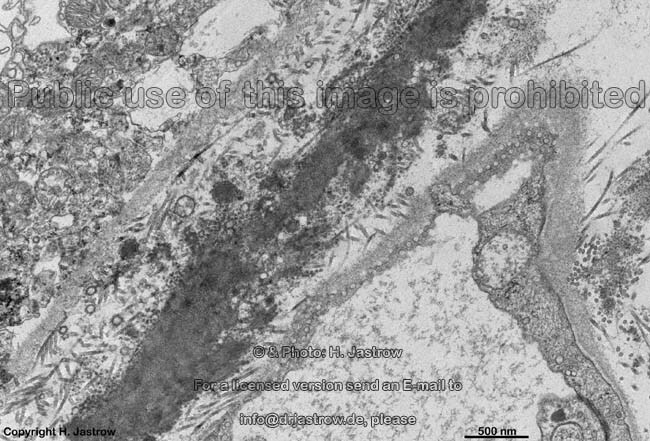 10. pigment epithelium (Stratum pigmenti = Pars pigmentosa; --> images) with pigment epithelial cells which phagocyte the tips of the rod or cone outer segments. The incorporated parts of the outer segments condense further and finally may no longer be distinguished from nearby pigment vesicles which prevent reflection of photons from incomeing light. 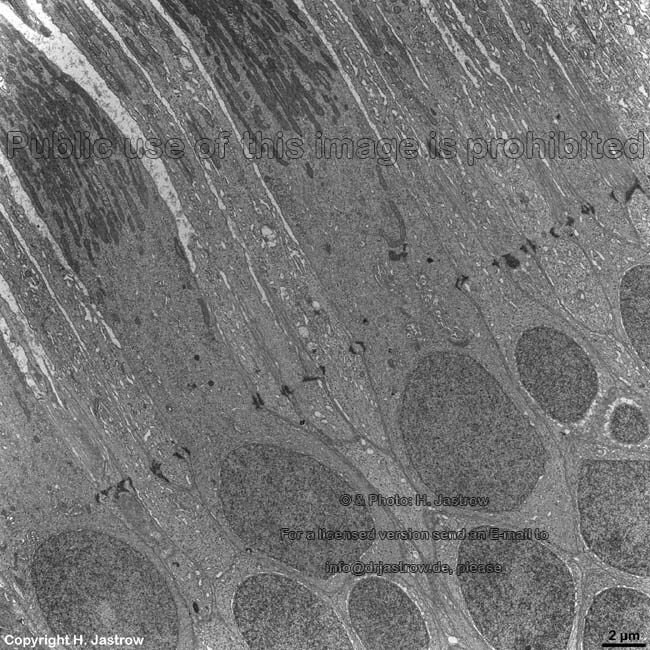 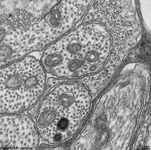 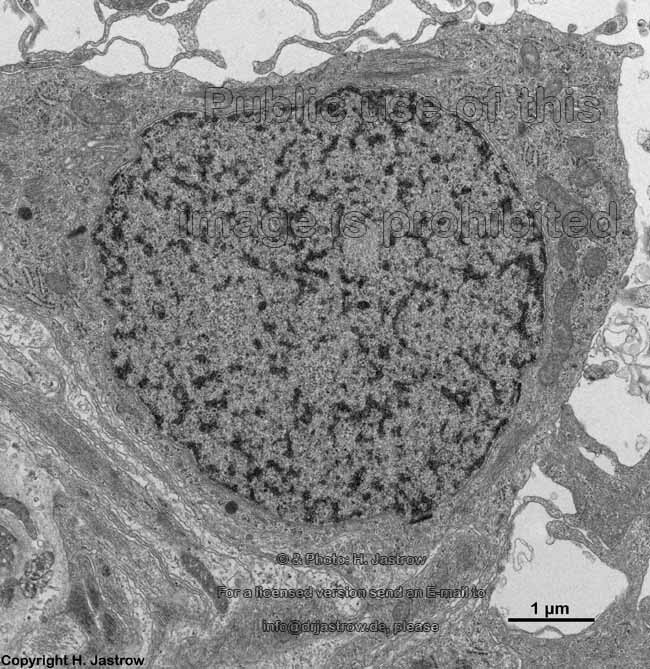 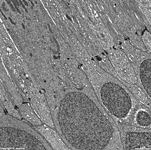 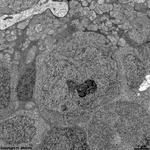 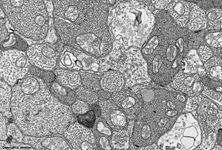 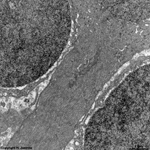 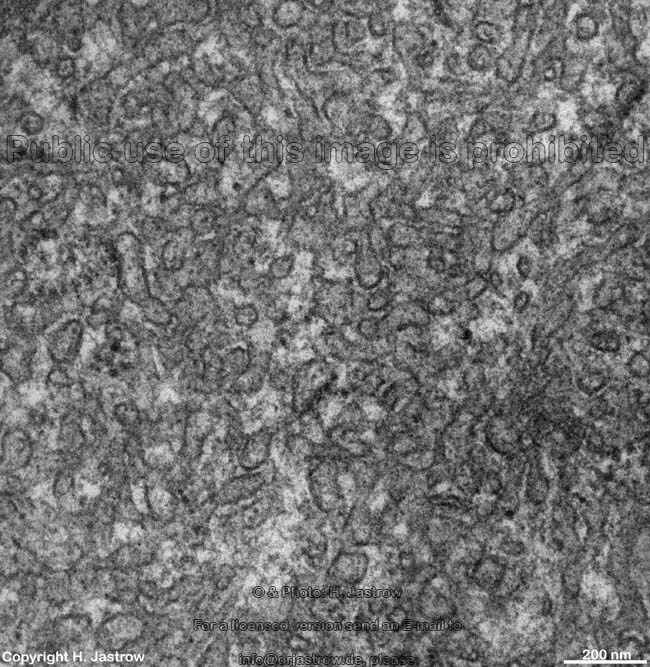 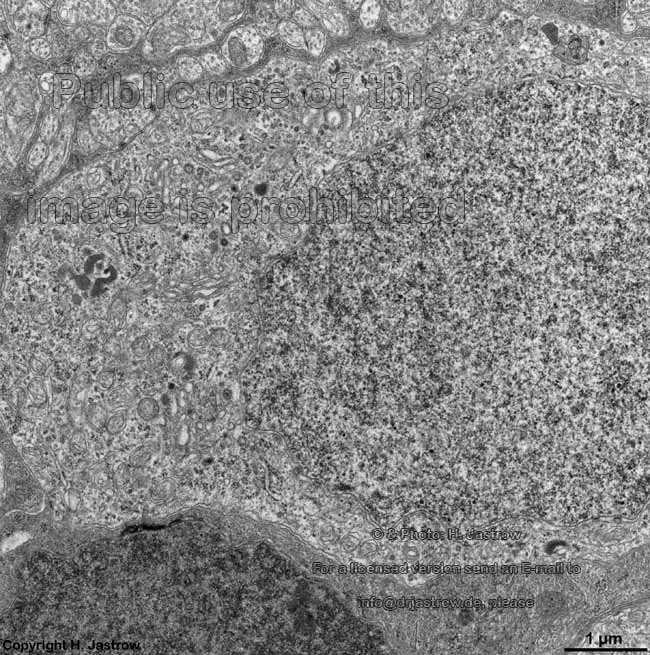 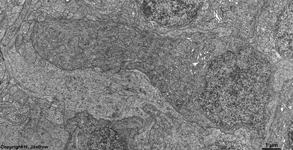 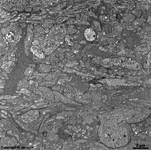 Vast amounts of smooth endoplasmic reticulum are characteristic for the cuboid pigment epithelial cells. 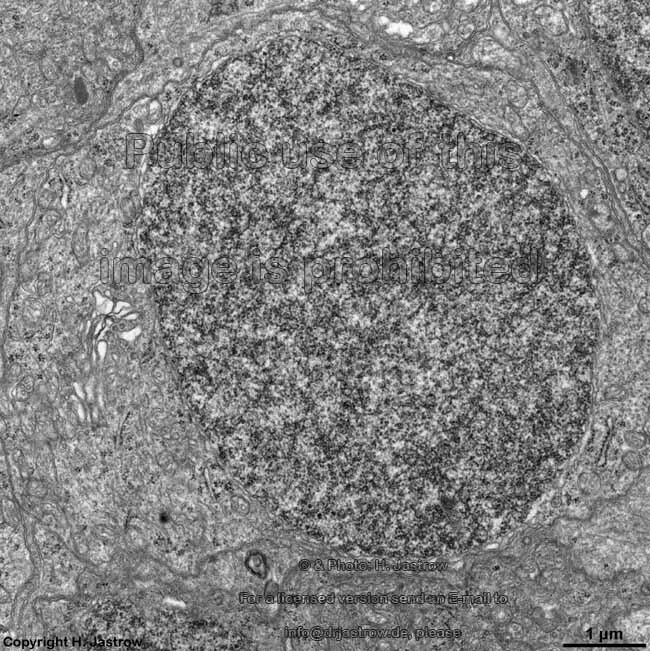 The junctional complexes between these cells are rich in tight junctions and the morphological base for the blood-retina barrier. 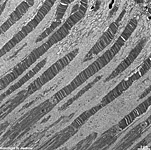 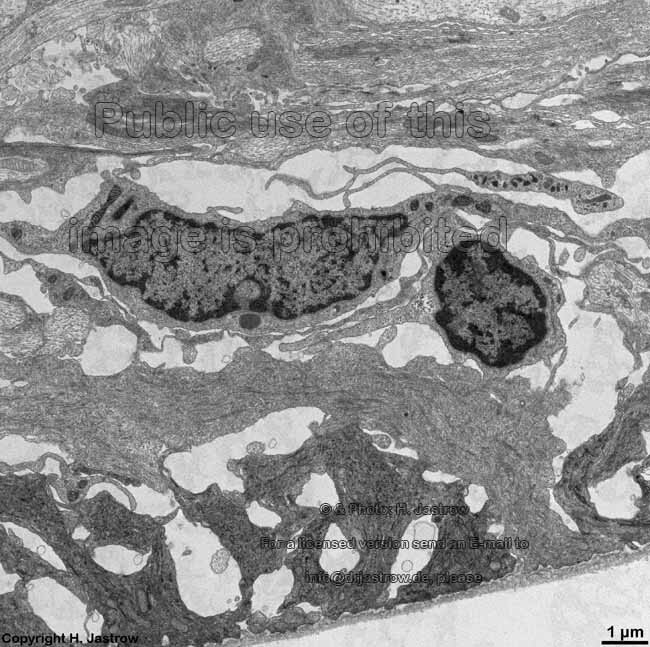 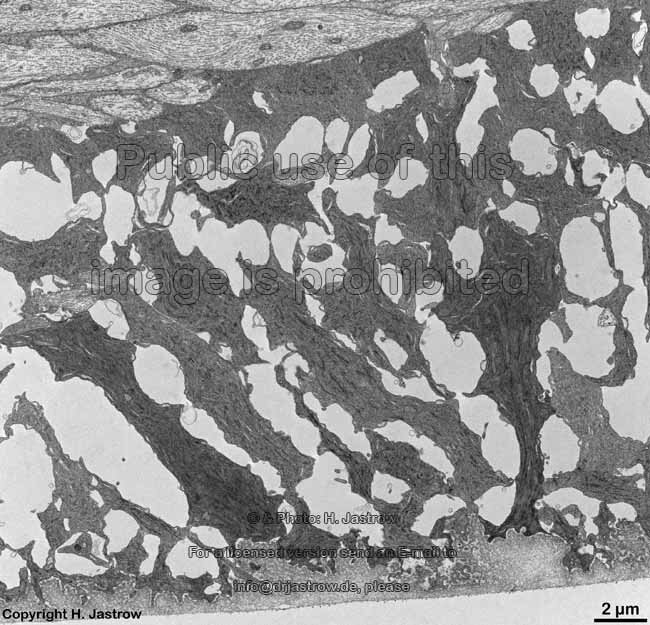 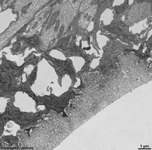 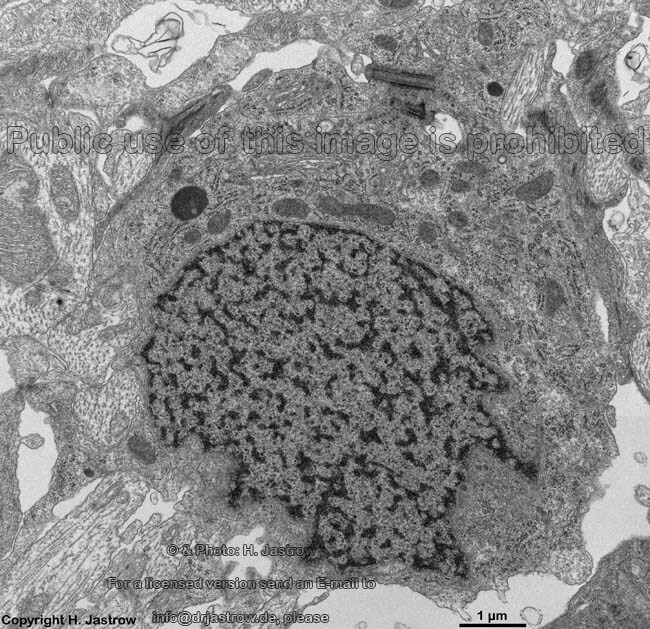 Underlying Bruch's membrane, a rather thick basement membrane with lots of elastic and collagen fibres comprises the border to the Lamina choroidocapillaris (--> images) which has lots of blood vessels. 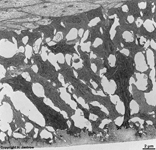 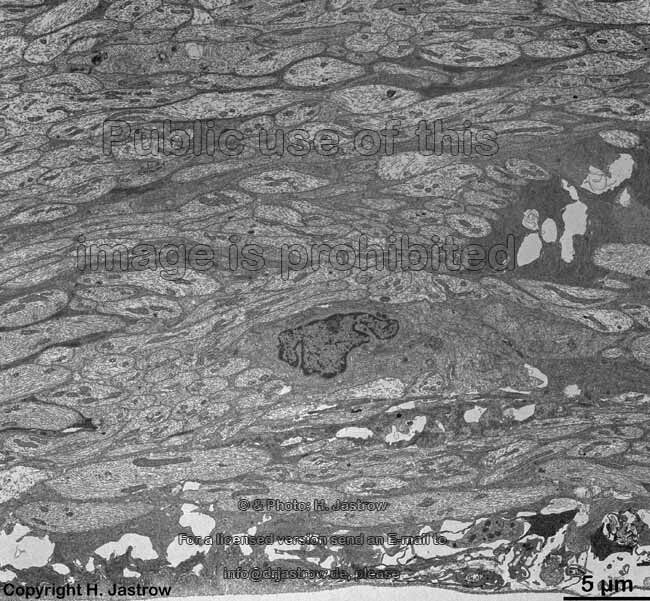 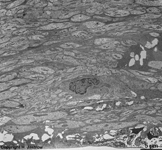 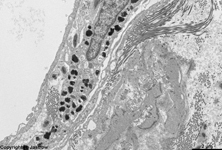 The subsequent choroidea shows pigment epithelial cells scattered in loose connective tissue with an abundance of smaller blood vessels (especially fenestrated capillaries and venoles). 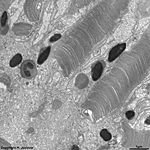 The outermost layer of the ocular bulb is the strong sclera which consists of thousands of very tight parallel ordered collagen fibre bundles. The human retina has about 6 000 000 cones and 120 000 000 rods, whereby the concentration of cones diminuishes considerably from the foveola to outside. 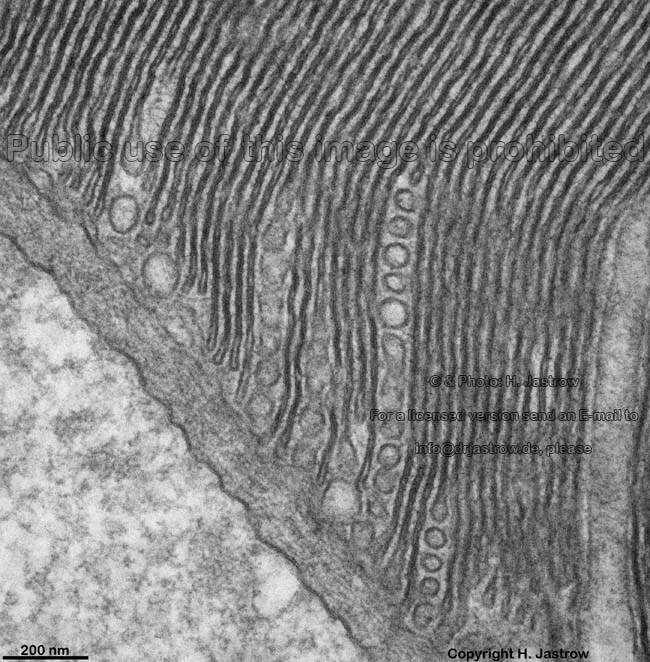 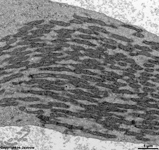 The very long outer segments of the photoreceptor cells show highly ordered membrane discs which reach forward into the pigment epithelium. 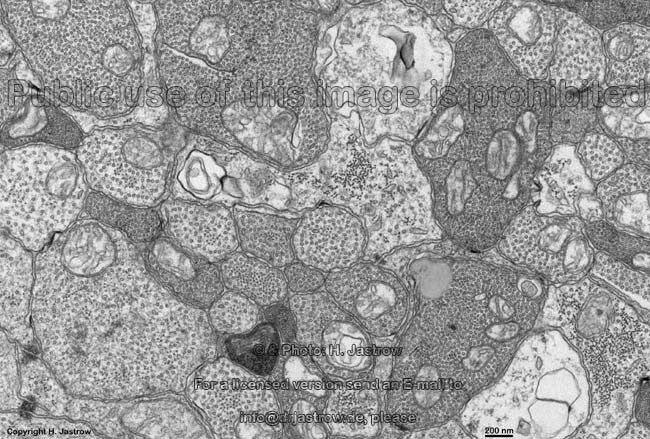 The visual pigment. 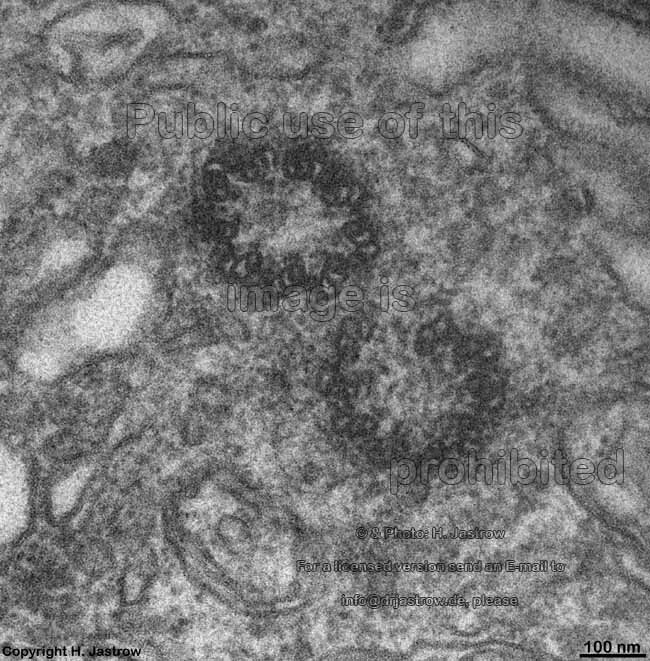 which is able to percept photons of the visible light, is located in these discs but too small to be visible in the electron microscope. 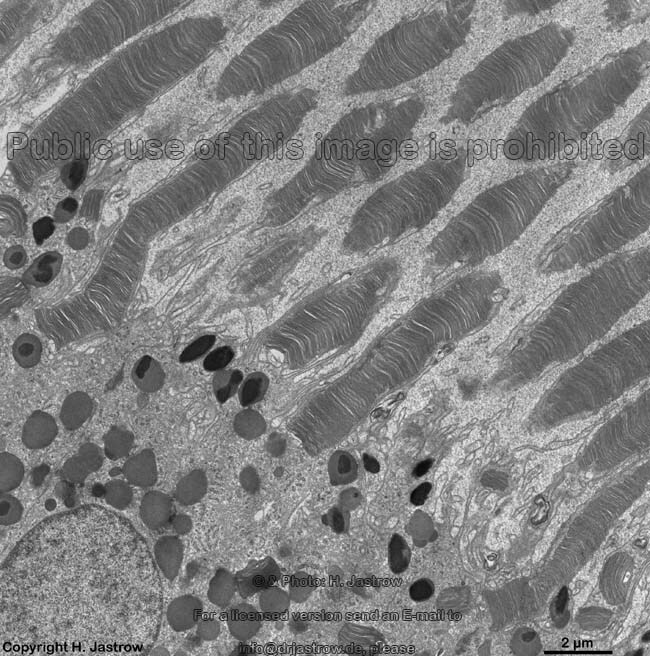 It is rhodopsin in rods which consists of the glycoprotein opsin and the bound pigment 11 cis-retinal as chromophor. 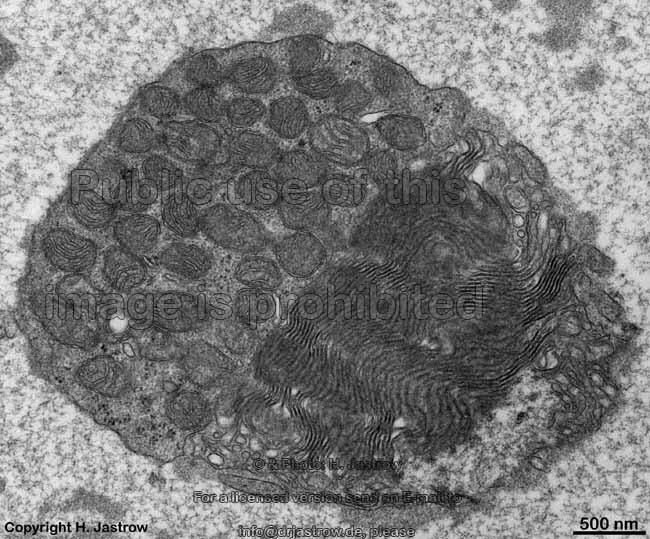 Rhodopsin is a transmembrane proteine, i.e. 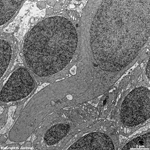 directly incorporated in the disc membrane. 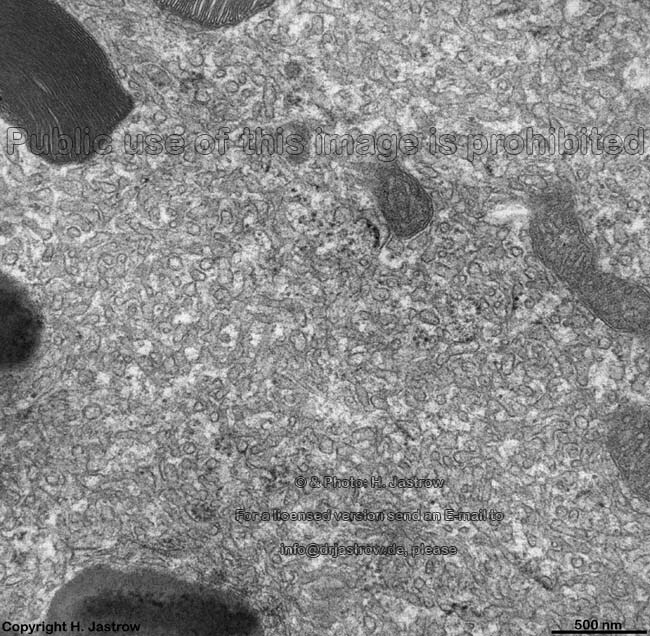 It is synthetised from vitamin A (retinol). Formation of the membrane discs is continious and it takes 10 days to renew a complete outer segment. 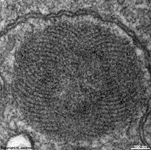 Formation starts at the border to the inner segment. 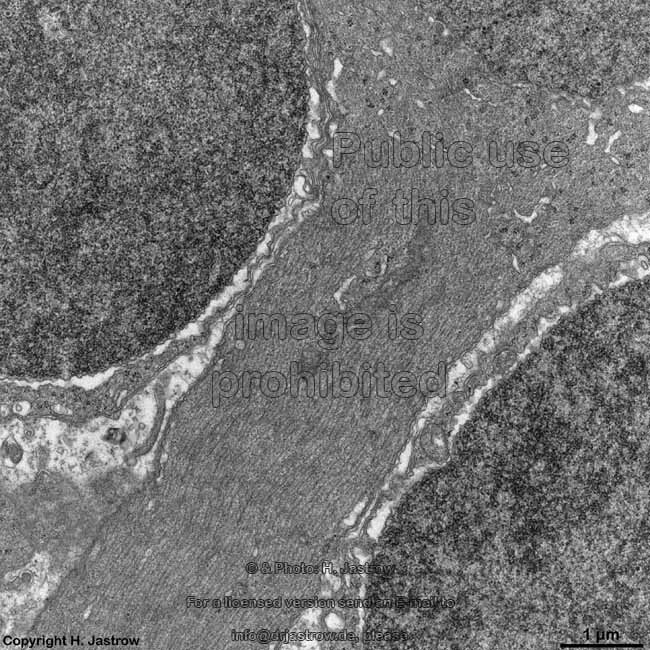 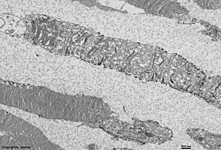 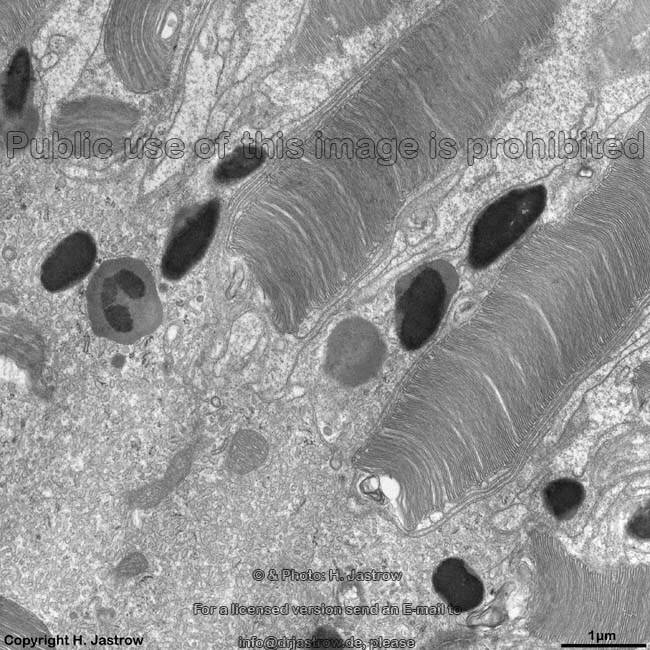 The small cytoplasma bridge between inner and outer segment is stabilised by a simple cilium (no kinocilium, only 9x2 outer microtubules but no inner pair of microtubules; see images). 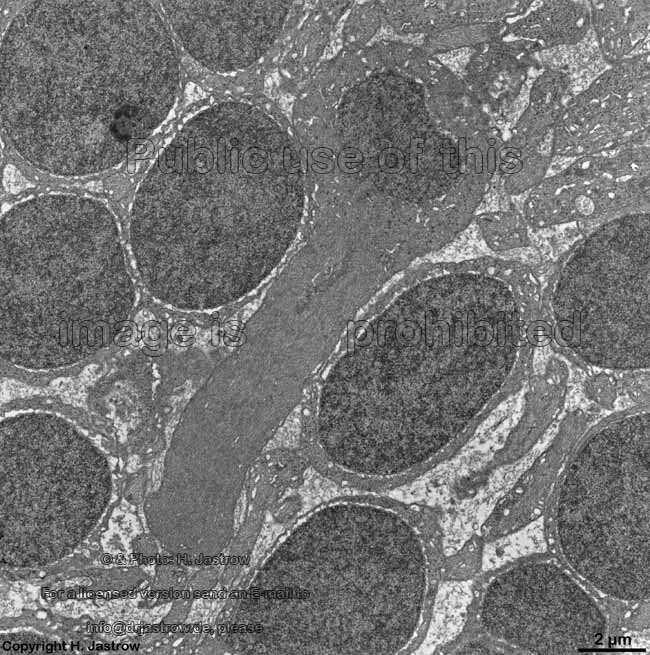 Rods are responsible for perception of small amounts of light and darkness (viewing of grays at dusk = scotopic vision with inferior spatial resolution). 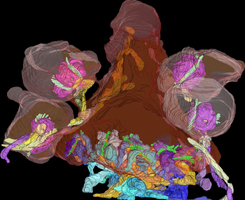 Humans have 3 different kinds of cones for perception of different colours. Cones react to colour and colour intensity and have more complex visual pigments. 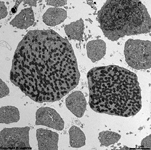 Due to a very complicated interconnection of different cell types the spatial resolution of cones is much better than that of rods. 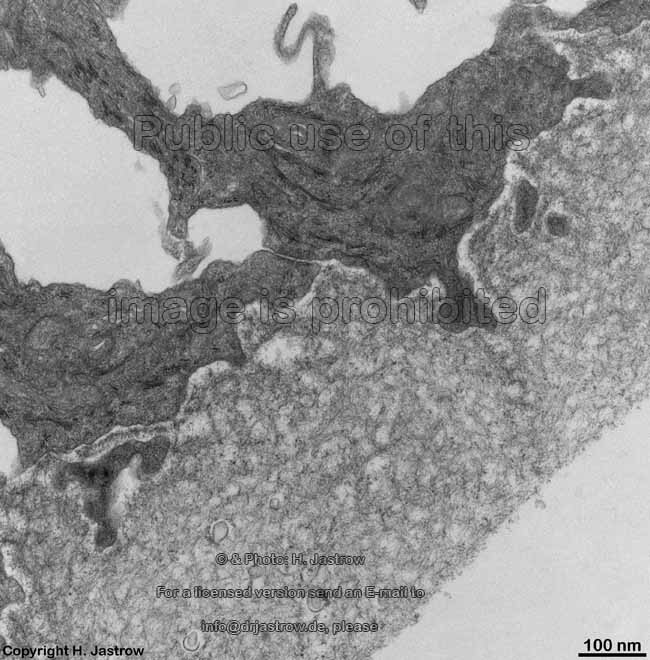 However this photopic vision requires more light (intensity) than scotopic vision. 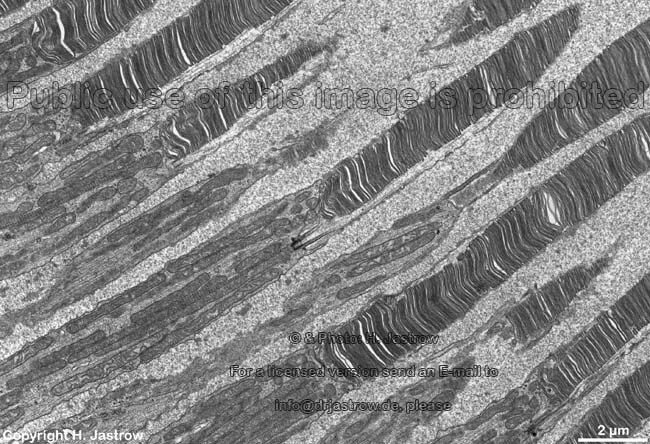 The pigments involved in colour vision of cones have different absorption maxima of wave lengths of light which are the basis for all the about 7 million different colours humans may percieve. 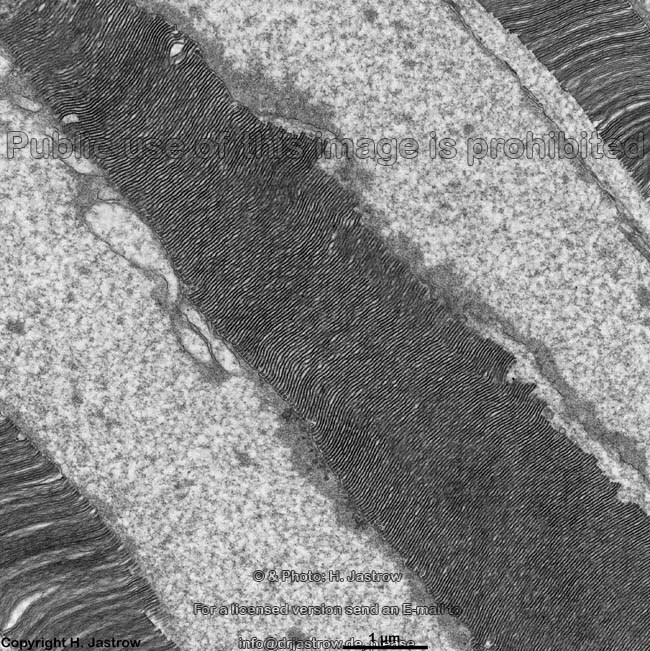 The wave lengths for the basic colours are: 700nm IIII Red, 546 nm IIII Green, 435 nmIIII Blue. 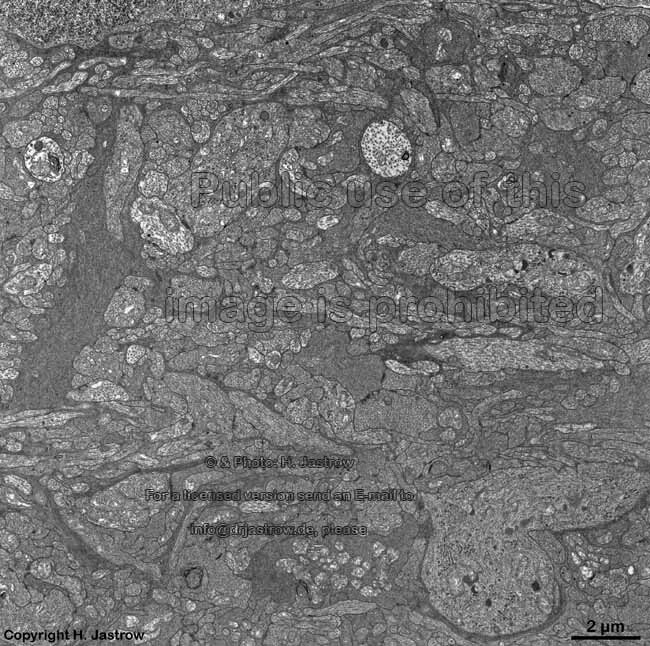 All other colours are generated by different intensities i.e. mixtures of the basic colours. 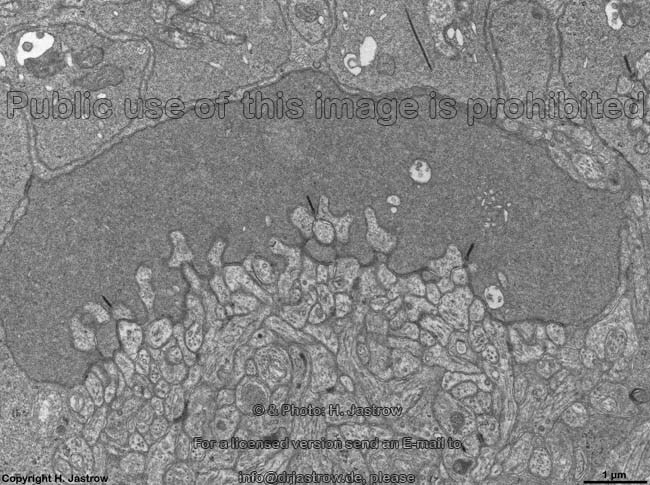 The morphological base for this is the sophisticated interconnection of the different visual cells. 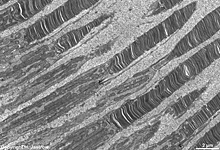 Some examples: yellow is generated by red and green in same intensity; white = red + green + blue in maximal intensity, otherwise grays are generated, black = no wave lengths. 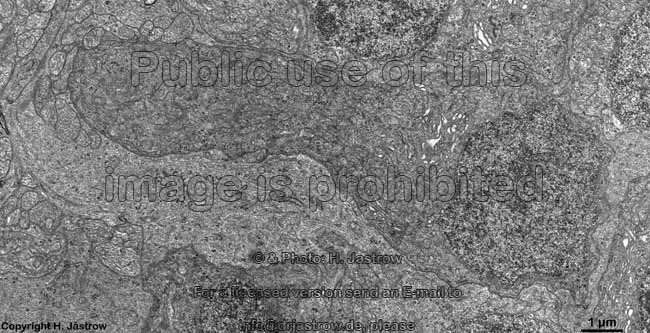 All colours may be percieved at different intensities (as it is the case for RGB values of monitors). 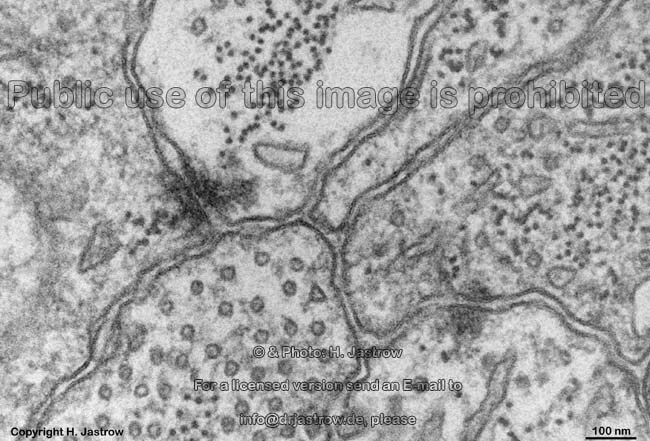 With the exception of the central region (fovea) one bipolar cell always sends dendrites to several receptor terminals and several bipolar cell axons reach one and the same multipolar ganglion cell. 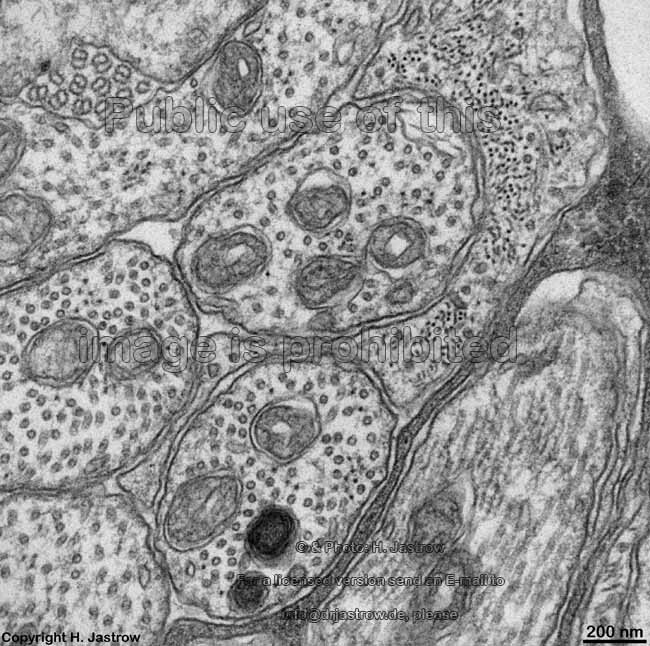 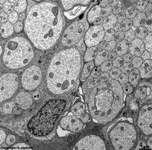 The axons of these ganglion cells collect to fibre bundles which form the optic nerve (Nervus opticus = brain nerve II) which runs to the brain. 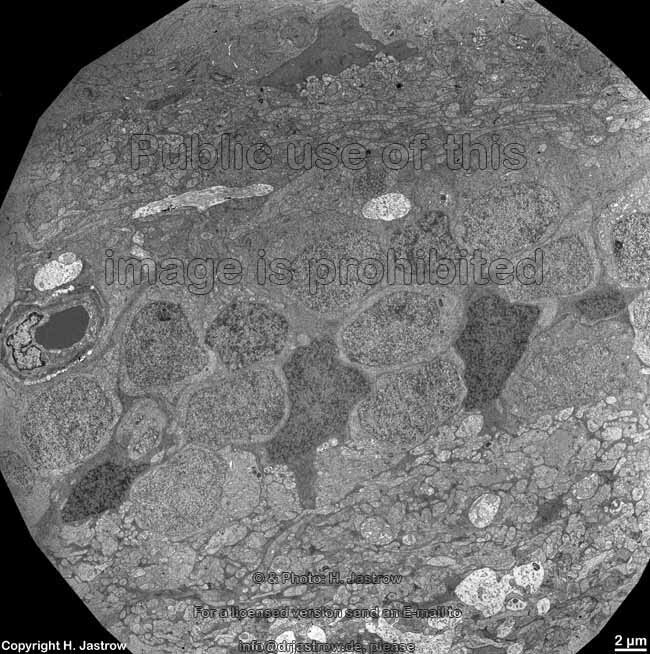 I am very grateful to N. Ardjomand, E. Haller-Schober, M. Theisl (university clinic Graz, Austria) & Prof. B. Stoffelns (university eye clinic Mainz, Germany) for specimens. Images, page & copyright H. Jastrow.